No matter what kind of UTV you’re dreaming of, 2018 is full of amazing choices. 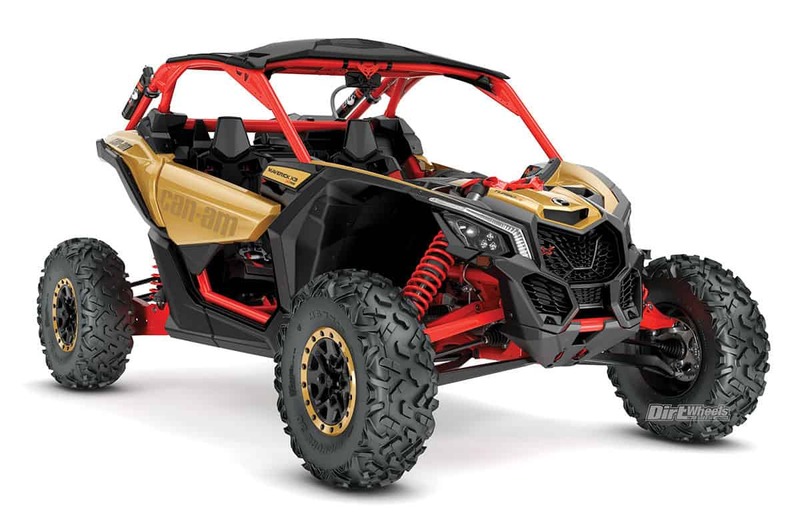 Just to name a few, the sport category has Can-Am’s 172-horsepower Maverick X3s, in addition to the new family of 50-inch Maverick Trail UTVs, and Polaris features the new RZR XP Turbo Dynamix with active suspension. 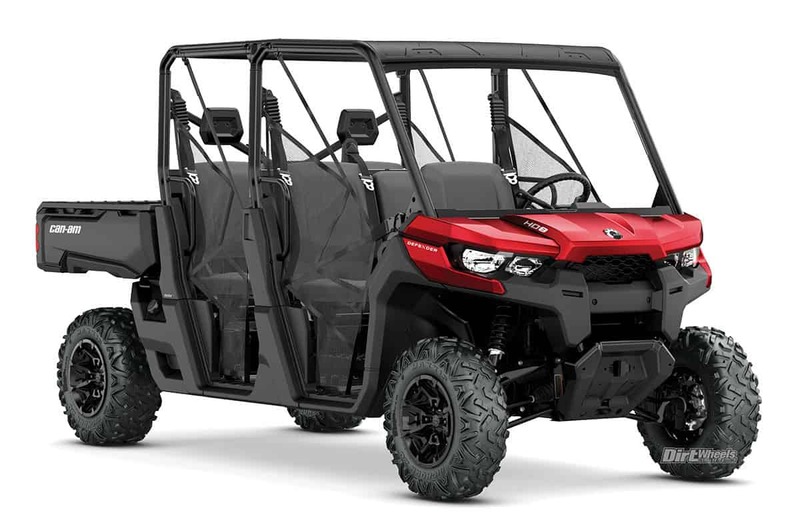 In recreation utility, there’s the all-new Yamaha Wolverine X4, Polaris’ all-new Ranger XP 1000 and Kawasaki’s Mule Pro-FXR. 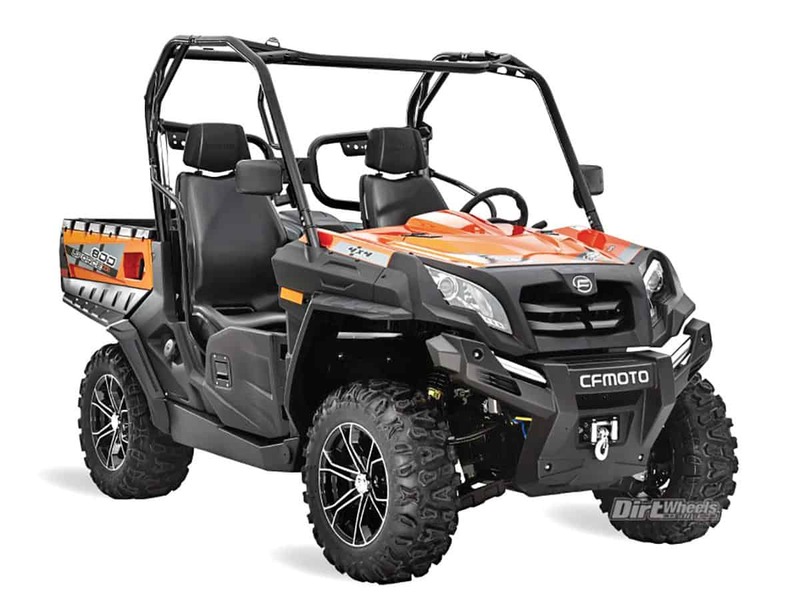 Dirt Wheels’ “UTV Buyer’s Guide” is the only place you can compare them all, so take advantage of all the photos, specs and prices to find the best machine for you. The X3 Turbo line starts with the 120-horsepower base model. X3 Turbo Rs jump to 172 horsepower. These machines are 64 inches wide and have 20 inches of travel front and rear. The base X3 and the X3 Turbo R have Fox QS3 shocks. The X ds has Fox Podium RC2 reservoir shocks and beadlock wheels. The X3s have excellent handling and ergonomics. Engine type DOHC inline triple, Displacement 900cc, Suspension: Front Dual A-arm/20.0”, Rear Trailing Arm/20.0”, Length/width/height 131.0”/64.0”/66.0”, Fuel capacity 10.5 gal., Dry weight 1470 lb./1470 lb./1490 lb., Towing N/A, Bed capacity 200 lb., Price $19,999/$22,999/$24,999. 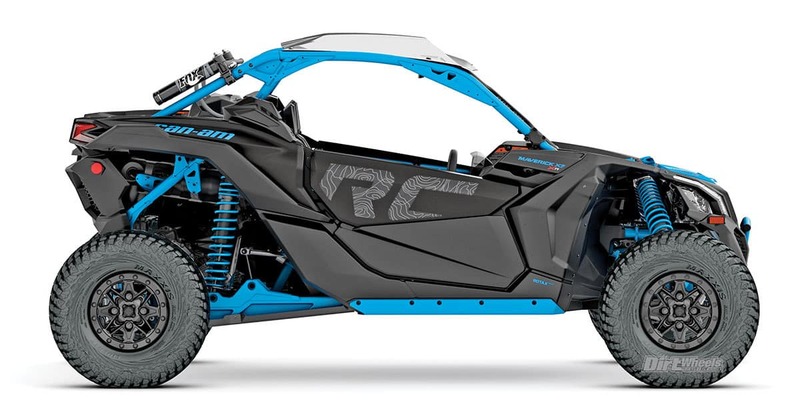 The Maverick X3 X rs’ performance specs are unmatched. This 172-horsepower, 72-inch-wide machine has 22 inches of travel up front and 24 inches in the rear. Fully adjustable Fox shocks, 30-inch Maxxis Bighorn 2.0 tires on beadlock wheels and a roof are standard equipment. Engine type DOHC inline triple, Displacement 900cc, Suspension: Front Dual A-arm/22.0”, Rear Trailing Arm/24.0”, Length/width/height 132”/72”/67”, Fuel capacity 10.5 gal., Dry weight 1589 lb., Towing N/A, Bed capacity 200 lb., Price $26,899. 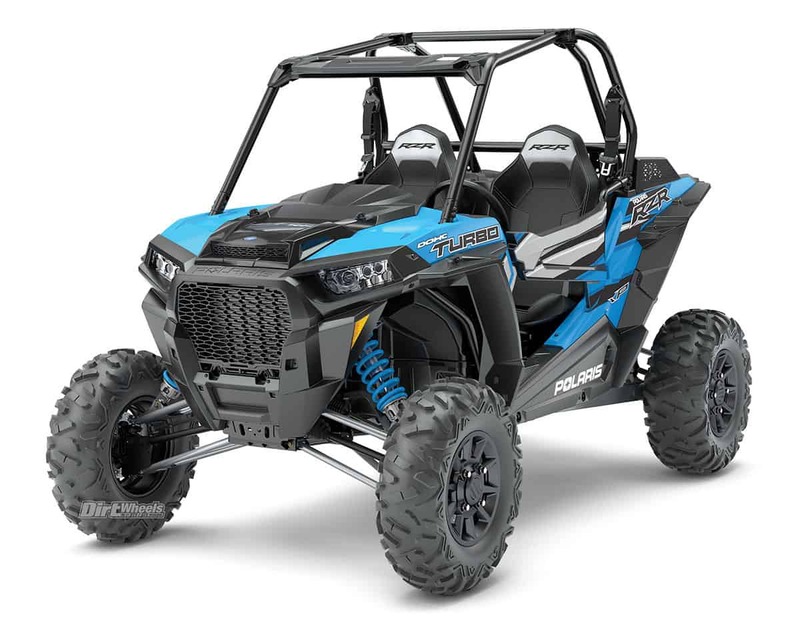 New for 2018, the 64-inch-wide, 120-horsepower X3 X rc Turbo and 72-inch-wide, 172-horsepower X3 X rc Turbo R come ready to rock crawl and tackle tough, technical trails. 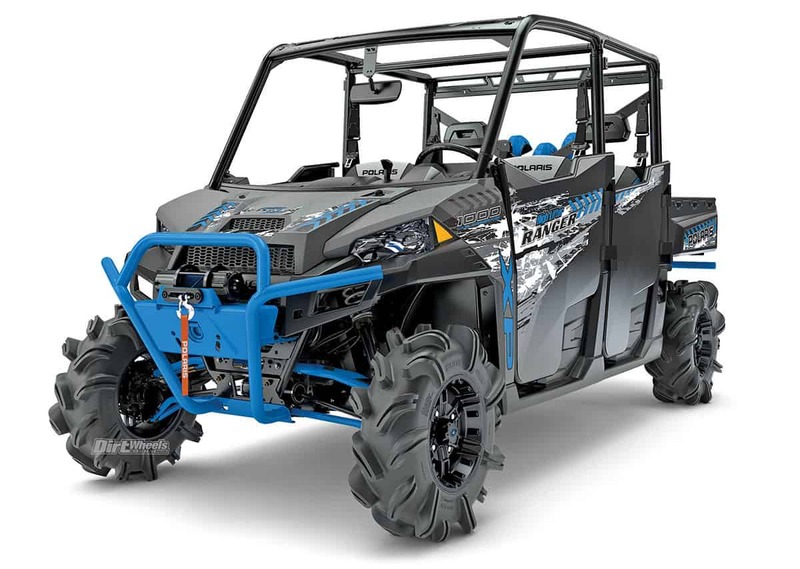 The Smart-Lok true lockaing front differential and 30-inch Maxxis Liberty tires on 14-inch wheels provide the traction needed for extremely challenging terrain, and a winch is also included. The Turbo has 20 inches of travel front and rear from Fox QS3 shocks. The Turbo R has 22 inches of front travel and 24 inches in the rear with fully adjustable Fox shocks, and it also comes with beadlocks, full doors and a roof. Engine type DOHC inline triple, Displacement 900cc, Suspension: Front Dual A-arm/20.0/22.0”, Rear Trailing Arm/20.0/24.0”, Length/width/height 131”/64”/66”; 133”/72”/67”, Fuel capacity 10.5 gal., Dry weight 1631 lb./1751 lb., Towing N/A, Bed capacity 200 lb. , Price $23,999/$28,999. 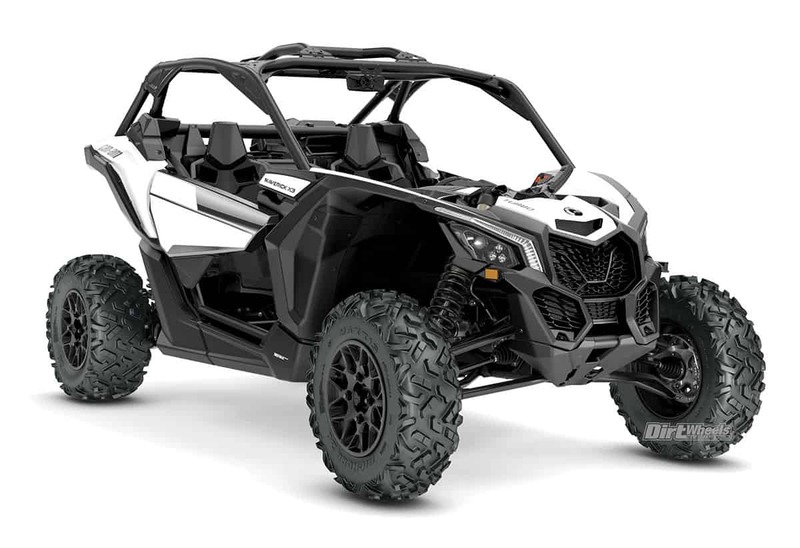 Can-Am’s Max models let four riders experience the X3’s incredible performance and handling. The base model makes 120 horsepower, and the Turbo Rs produces 172 horsepower. They’re 64 inches wide and have 20 inches of travel front and rear. The base X3 Max and the X3 Max Turbo R have Fox QS3 shocks. The X3 Max X ds has Fox Podium RC2 reservoir shocks and beadlock wheels. The four-seat Maverick X3 Max X rs is a family car with stunning performance. The extended wheelbase and adjustable front and rear seats create a roomy, comfortable cabin. This 172-horsepower, 72-inch-wide machine has 22 inches of travel front and rear. Fully adjustable Fox shocks, 30-inch Maxxis Bighorn 2.0 tires on beadlock wheels and a roof are standard equipment. Engine type DOHC inline triple, Displacement 900cc, Suspension: Front Dual A-arm/22.0”, Rear Trailing Arm/24.0”, Length/width/height 165.5”/72”/66”, Fuel capacity 10.5 gal., Dry weight 1849 lb., Towing N/A, Bed capacity 200 lb., Price $29,399. Bed capacity 150 lb., Price $21,999/$23,999. 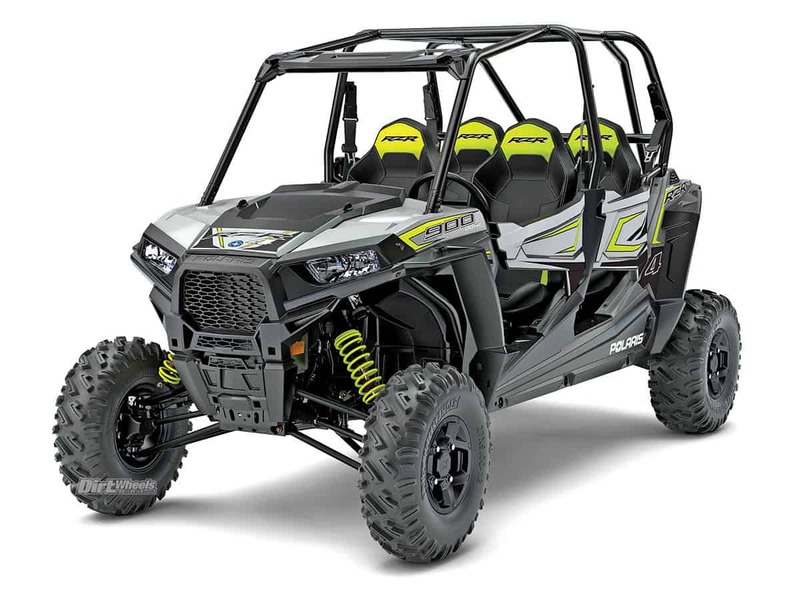 The two- seat Maverick DPS and four-seat Maverick Max DPS are 64-inch-wide sport machines with 101 horsepower and 14 inches of travel front and rear from Fox QS3 shocks. Mavericks have easy-to-enter cabs and comfortable seating that’s more upright than the X3 models. Engine type SOHC V-twin, Displacement 976cc, Suspension: Front Dual A-arm/14.0”, Rear Torsional Trailing Arm/14.0”, Length/width/height 118.8”/64”/74.2”;148”/64”/78”, Fuel capacity 10 gal., Dry weight 1324 lb./1572 lb., Towing N/A, Bed capacity 200 lb., Price $17,599/$19,599. Engine type SOHC V-twin, Displacement 976cc, Suspension: Front Dual A-arm/12.0”, Rear Torsional Trailing Arm/12.0”, Length/width/height 118.8”/60”/72.2”, Fuel capacity 10 gal., Dry weight 1291 lb., Towing N/A, Bed capacity 200 lb., Price $15,699/$16,599/$18,599. 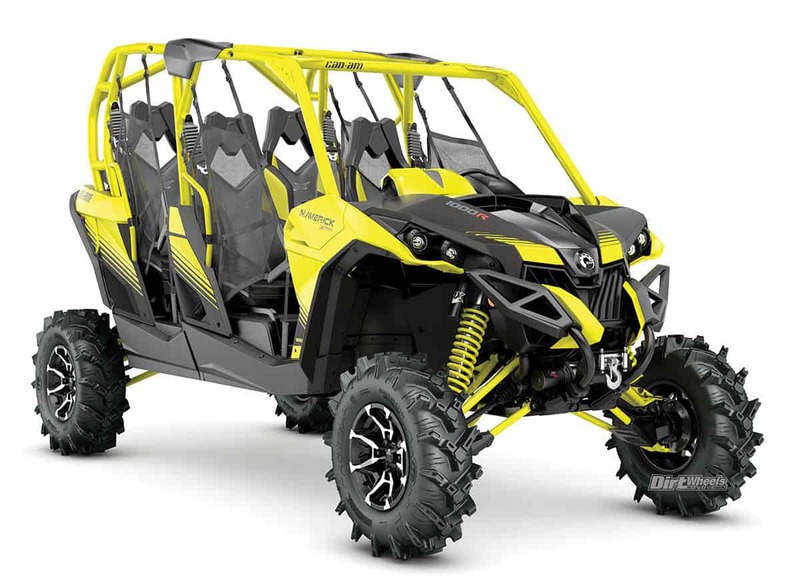 New for 2018, Can-Am’s 50-inch-wide Trail UTVs come with 51-horsepower 800cc or 75-horsepower 1000cc V-twins in base and Dynamic Power Steering (DPS) models. Base models have steel wheels, and DPS machines come with aluminum wheels. Base 1000, 800 DPS and 1000 DPS models have doors. The base 800 comes with nets. All machines have preload-adjustable gas shocks with 10 inches of travel front and rear. Engine type SOHC V-twin, Displacement 800cc/976cc, Suspension: Front Dual A-arm/10.0”, Rear Torsional Trailing Arm/10.5”, Length/width/height 118.8”/64”/74.2”; 148”/64”/78”, Fuel capacity 10 gal., Dry weight 1331 lb./1364 lb. Towing N/A, Bed capacity 300 lb., Price $10,999/$/$12,999/$12,999/$14,799. Engine type SOHC V-twin,Displacement 976cc, Suspension: Front Dual A-arm/10.0”, Rear Torsional Trailing Arm/10.0”, Length/width/height 120.2”/62.5”/72”; 148”/58.6”/75.4”, Fuel capacity 10 gal., Dry weight 1291 lb./1635 lb., Towing 1500 lb., Bed capacity 600 lb.,Price $20,299/$22,099. Engine type SOHC V-twin, Displacement 800cc/976cc, Suspension: Front Dual A-arm/10.0”, Rear Torsional Trailing Arm/10.0”, Length/width/height 120.2”/62.5”/72”; 150”/62.5”/76”; 118.3”/61.2”/72”; 148.5”/61.2”/76”, Fuel capacity 10 gal., Dry weight 1291 lb./1572 lb., Towing 1500 lb., Bed capacity 600 lb., Price $14,599/$19,099/$12,299/$14,299. 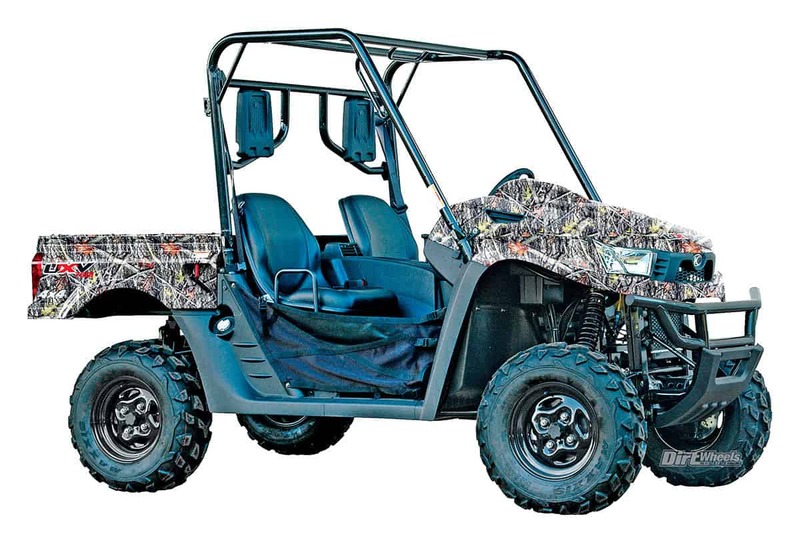 The Mossy Oak Hunting Edition is only available as a two-seat 1000. 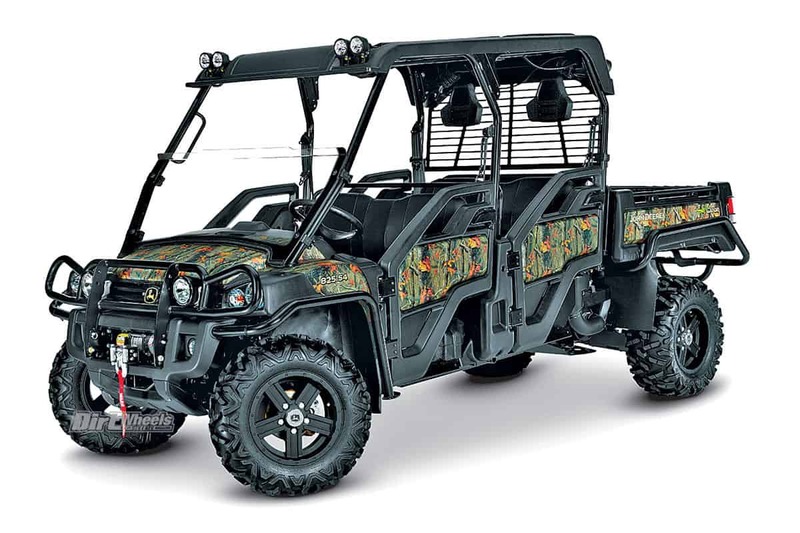 It comes with Mossy Oak Break-Up Country Camo bodywork, two Kolpin 6.0 Impact gun boots and holders, a heavy-duty front bumper, 4500-pound winch, bed rails, mud guards and a full skid plate. Engine type SOHC V-twin, Displacement 976cc, Suspension: Front Dual A-arm/10.0”, Rear Torsional Trailing Arm/10.0”, Length/width/height 120.2”/62.5”/72”, Fuel capacity 10 gal., Dry weight 1291 lb., Towing 1500 lb., Bed capacity 600 lb., Price $18,899. Engine type SOHC V-twin, Displacement 800cc, Front suspension travel 10”, Rear suspension travel 10”, Length/width/height 118.3”/58.6”/72”, Fuel capacity 10 gal., Dry weight 1291 lb., Towing 1500 lb., Bed capacity 600 lb., Price $11,199. Six-passenger Defender Max, Max DPS and Max XT models are available with 50-horsepower 800cc or 72-horsepower 1000cc engines. The manual-steering base model is only available as an 800. Defender Max DPS vehicles have Tri-Mode power steering. XTs come with a Warn winch and full roof. Engine type SOHC V-twin, Displacement 800cc/976cc, Suspension: Front Dual A-arm/10.0”, Rear Torsional Trailing Arm/10.0”, Length/width/height 152.5”/62.0”/75.3”, Fuel capacity 10.6 gal., Dry weight 1710 lb., Towing 2000 lb., Bed capacity 1000 lb., Price $12,399/$14,699/$17,199. Engine type SOHC V-twin, Displacement 976cc, Suspension: Front Dual A-arm/10.0”, Rear Torsional Trailing Arm/10.0”, Length/width/height 125.6”/64.0”/78.0”, Fuel capacity 10.6 gal., Dry weight 1658 lb., Towing 2000 lb., Bed capacity 1000 lb., Price $19,699. 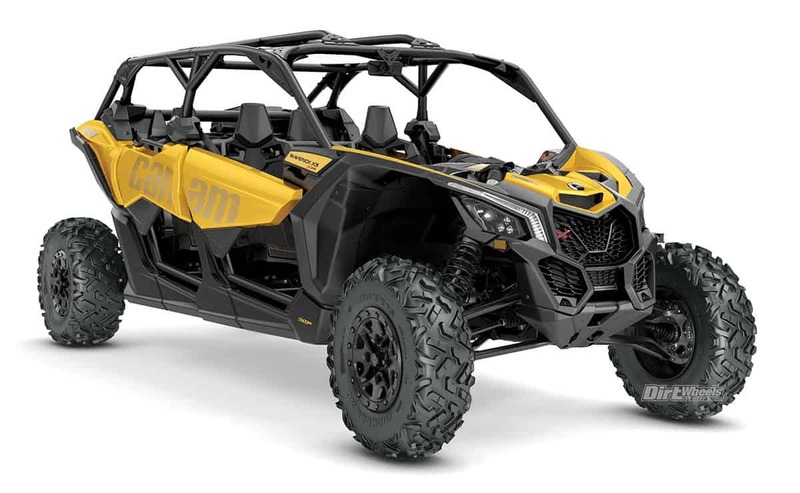 The Can-Am Defender XT comes with either a 72-horsepower Rotax HD10 V-twin engine or a 50-horsepower Rotax HD8 V-twin engine. 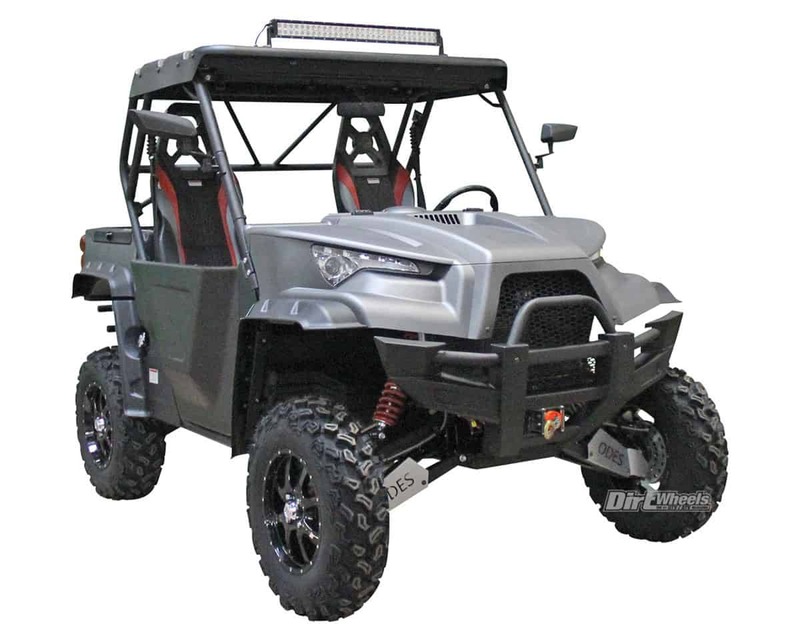 This machine comes with EPS, 14-inch aluminum wheels with 27-inch Maxxis Bighorn tires,a full roof and a Warn winch. The $21,599 XT Cab model has an enclosed cab and built-in heater. Engine type SOHC V-twin, Displacement 800cc/976ccc, Suspension: Front Dual A-arm/10.0”, Rear Torsional Trailing Arm/10.0”, Length/width/height 120.0”/62.0”/78.0”, Fuel capacity 10.6 gal., Dry weight 1550 lb., Towing 2000 lb., Bed capacity 1000 lb., Price $15,699–$21,599. 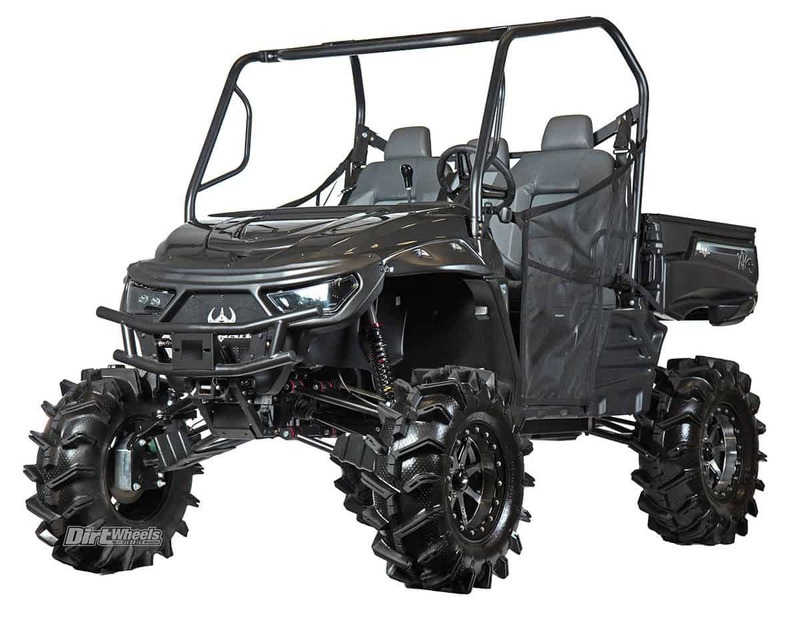 Can-Am’s Defender is a utility UTV that has recreational properties. The base model has stamped-steel wheels and manual steering. There are three engine options—500, 800 and 1000cc—which are paired to a CV-style transmission. The 4×4 system has a Visco-locking front differential. You can get each model with power steering. Engine type SOHC V-twin, Displacement 427cc/800cc/976cc, Suspension: Front Dual A-arm/10.0”, Rear Torsional Trailing Arm/10.0”, Length/width/height 120.0”/62.0”/78.0”, Fuel capacity 10.6 gal., Dry weight 1550 lb., Towing 1500 lb./2000 lb., Bed capacity 600 lb./1000 lb., Price $9,999/$11.599/$13.999. The sporty-looking ZForce 800EX comes with a 63-horsepower, 800cc, V-twin, four-stroke engine that is fuel injected and paired with an automatic CV transmission that has engine braking. A 3000-pound winch comes standard, along with a contoured roof and stainless steel bumpers. EPS comes stock, and this machine is 60 inches wide. Now it is joined by a 1000 in the same platform for 2018. Engine type SOHC V-twin, Displacement 800cc, Suspension: Front Dual A-arm/10.0”, Rear Dual A-arm/10.0”, Length/width/height 113.0”/59.0”/72.0”, Fuel capacity 7.1 gal., Dry weight 1212 lb., Towing N/A, Bed capacity N/A, Price $11,599. If you want a CFMoto that fits well on tight trails but still has 800cc power, then the ZForce 800 Trail EPS is for you. They are 51.2 inches wide for tight terrain. Dual-A-arm suspension with adjustable coil-over shocks are on all four corners, along with four-wheel hydraulic disc brakes. EPS and a 3000-pound-rated winch are standard. Engine type SOHC V-twin, Displacement 800cc, Suspension: Front Dual A-arm/10.0”, Rear Dual A-arm/10.0”, Length/width/height 113.0”/59.0”/72.0”, Fuel capacity 7.1 gal., Dry weight 1212 lb., Towing N/A, Bed capacity N/A, Price $10,799. The ZForce 500 Trail comes with EPS. There is a 38-horsepower four-stroke engine mated to a CV transmission. 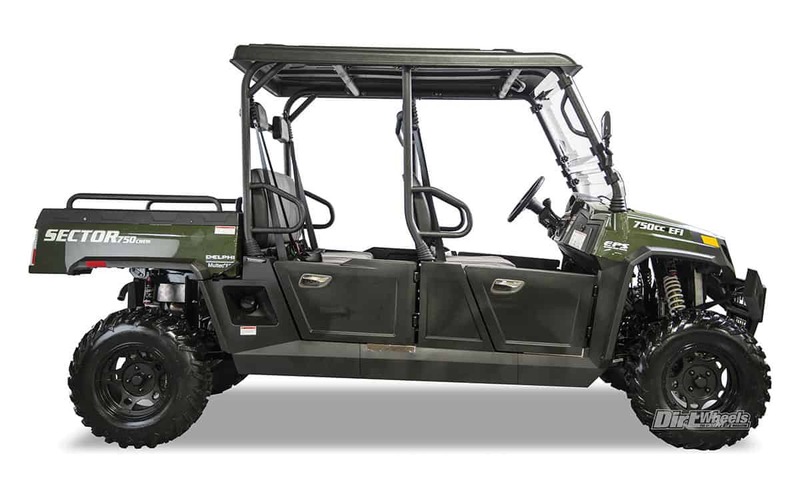 Fourteen-inch aluminum wheels and a 3000-pound winch are stock features. Compression- and rebound-adjustable shocks come on all four corners of this independently suspended CFMoto. Engine type SOHC single, Displacement 495cc, Suspension: Front Dual A-arm/N/A, Rear Dual A-arm/N/A, Length/width/height 113.0”/50.0”/70.0”, Fuel capacity N/A gal., Dry weight 1228 lb., Towing N/A, Bed capacity N/A, Price $8,999. 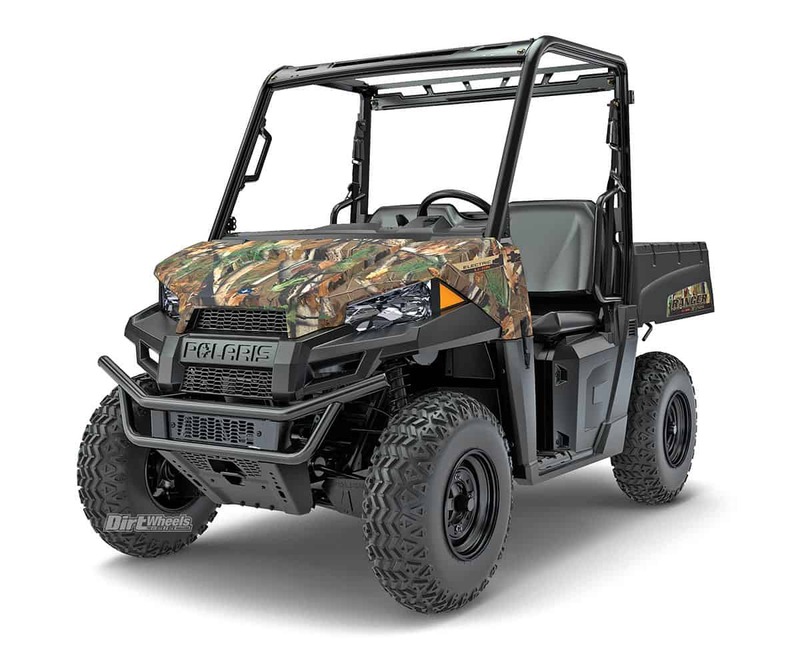 The CFMoto UForce line is designed for recreational driving and work. 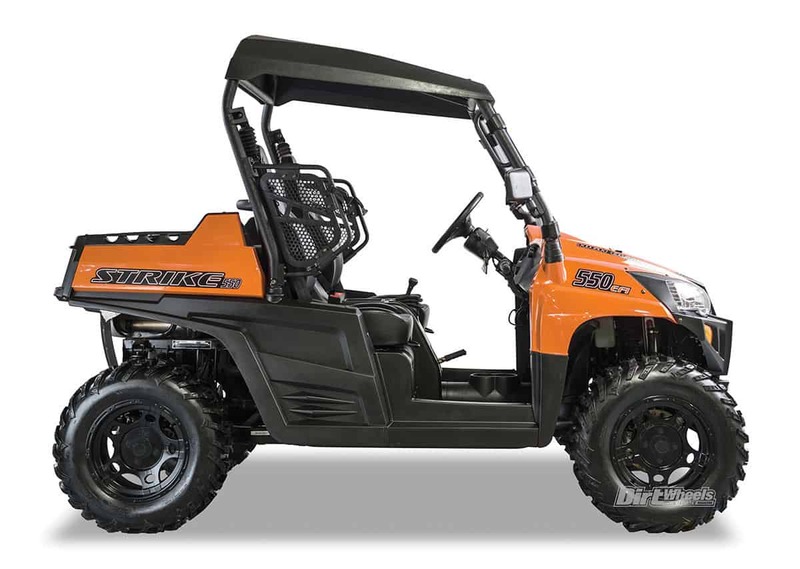 The 800 has an EFI 62-horsepower four-stroke engine. A CV transmission helps put power to the ground through a shaft-drive system. A tilt bed holds cargo, and the machine can pull up to 1250 pounds. Electronic power steering comes standard. Engine type SOHC V-twin, Displacement 800cc, Suspension: Front Dual A-arm/9.5”, Rear Dual A-arm/9.1”, Length/width/height 117.0”/56.0”/74.0”, Fuel capacity 7.1 gal., Dry weight N/A lb., Towing 1250 lb., Bed capacity N/A, Price $10,799. 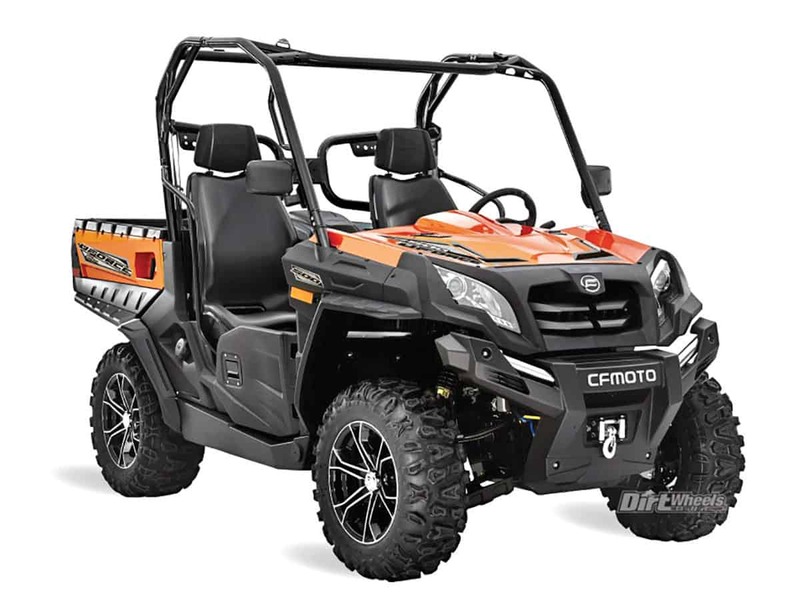 CFMoto’s UForce 500 EPS is a recreational utility machine designed to get the job done but still have fun. It sports an EFI, 500cc four-stroke engine. An automatic CV transmission with reverse transfers power to all four wheels. There is a front-lockable differential. There is a large dump box on the rear for utility purposes. Engine type SOHC single, Displacement 495cc, Suspension: Front Dual A-arm/N/A, Rear Dual A-arm/N/A, Length/width/height 117.0”/58.0”/73.0”, Fuel capacity N/A gal., Dry weight 347 lb., Towing N/A, Bed capacity N/A, Price $8,999. Engine type OHV V-twin, Displacement 976cc, Suspension: Front Dual A-arm/N/A, Rear Dual A-arm/N/A, Length/width/height 113.0”/65.0”/75.0”, Fuel capacity 7.3 gal., Dry weight 1521 lb., Towing 1764 lb., Bed capacity 350 lb., Price $13,999. 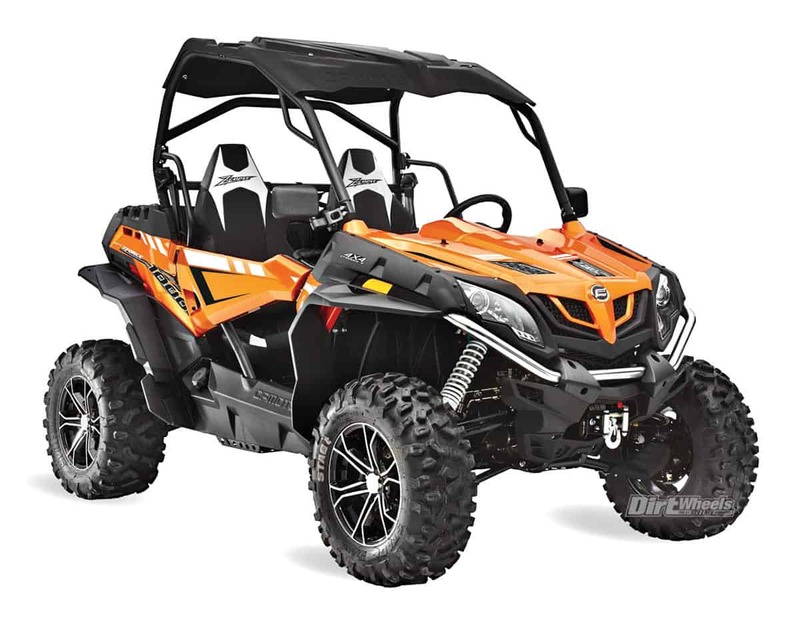 Engine type OHV V-twin, Displacement 976cc, Suspension: Front Dual A-arm/N/A, Rear Dual A-arm/N/A, Length/width/height 141.0”/65.0”/77.0”, Fuel capacity 7.3 gal., Dry weight 1697 lb., Towing 1764 lb., Bed capacity 350 lb., Price $15,999. 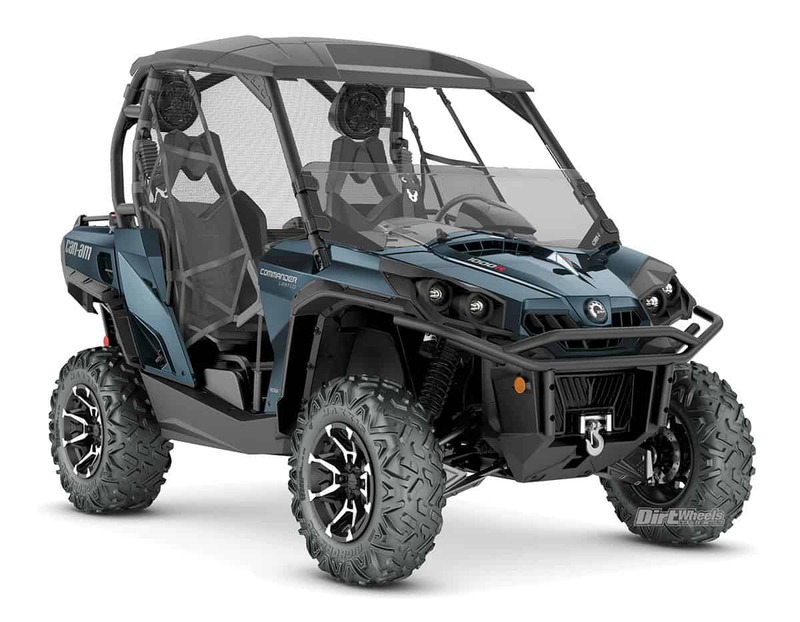 The Hisun Strike 900 carries a 924cc, and the Strike 800 utilizes an 800cc. Both are V-twin engines that are electronically fuel injected. The towing capacity is 1,764 pounds, and there is a 7.3-gallon fuel tank. The transmission is a fully automatic CVT with shaft drive. A 3500-pound winch comes standard. 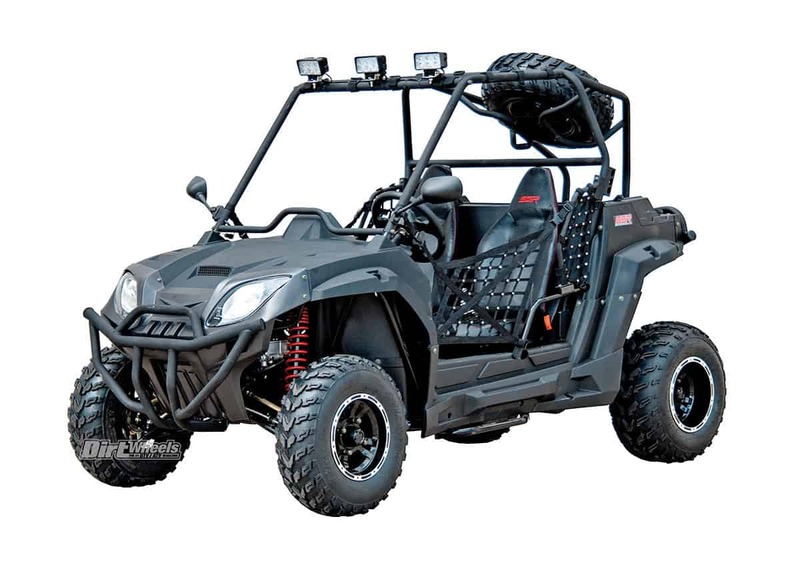 Engine type OHV V-twin, Displacement 924cc/800cc, Suspension: Front Dual A-arm/N/A, Rear Dual A-arm/N/A, Length/width/height 106.0”/60.0”/73.0”, Fuel capacity 7.3 gal., Dry weight 1697/1286 lb., Towing 1764/1200 lb., Bed capacity 350 lb., Price $11,599/$10,999. The Hisun Strike 550 utilizes a frame similar to the Strike 900 and 800. The width is a tight-trail-worthy 53.5 inches. The engine is an EFI, 546cc, single-cylinder four-stroke mated to a CV transmission with reverse. Independent dual-A-arm suspension comes on the front and rear of this machine, and hydraulic disc brakes slow it down. Engine type OHV single, Displacement 546cc, Suspension: Front Dual A-arm/N/A, Rear Dual A-arm/N/A, Length/width/height 106.0”/54.0”/73.0”, Fuel capacity 7.3 gal., Dry weight 1367 lb., Towing 1200 lb., Bed capacity 350 lb., Price $8,999. The Strike 250 is a snug but possible fit for an adult. A roof, windshield, lights, front bumper, rear-view mirrors, half doors and a winch are all standard. An EFI, 229cc, single-cylinder four-stroke engine powers the Strike. The most recent update was 33-percent-lower gearing for 2017. There are new wheels and colors for 2018. 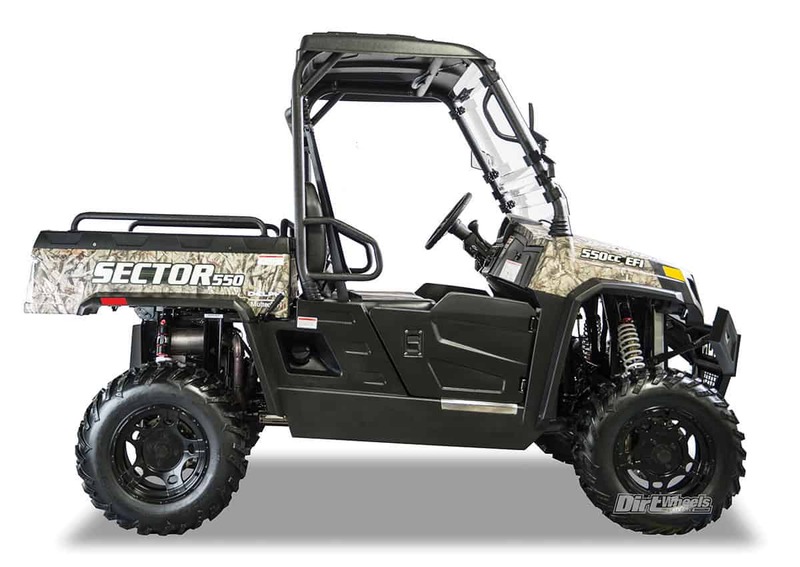 The $4749 Sector 250 is another machine in Hisun’s lineup. 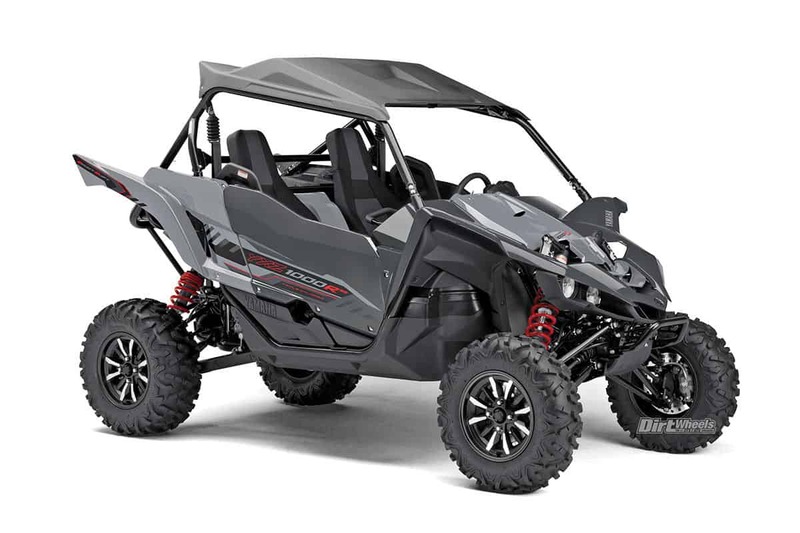 Engine type OHV Single, Displacement 229cc, Suspension: Front Dual A-arm/N/A, Rear Swingarm/N/A, Length/width/height 89.0”/50.0”/59.0”, Fuel capacity 3.5 gal., Dry weight 657 lb., Towing N/A, Bed capacity 50 lb., Price $4,699. Hisun’s work-oriented Sector 1000 shares the same 976cc four-stroke powerplant that the Crew model comes with, so it has the same power with less weight. It has a locking front differential in its 4×4 system. A 3500-pound winch, electronic power steering, aluminum wheels, a roof and windshield are all standard features, so it comes extremely well equipped right off the showroom floor. 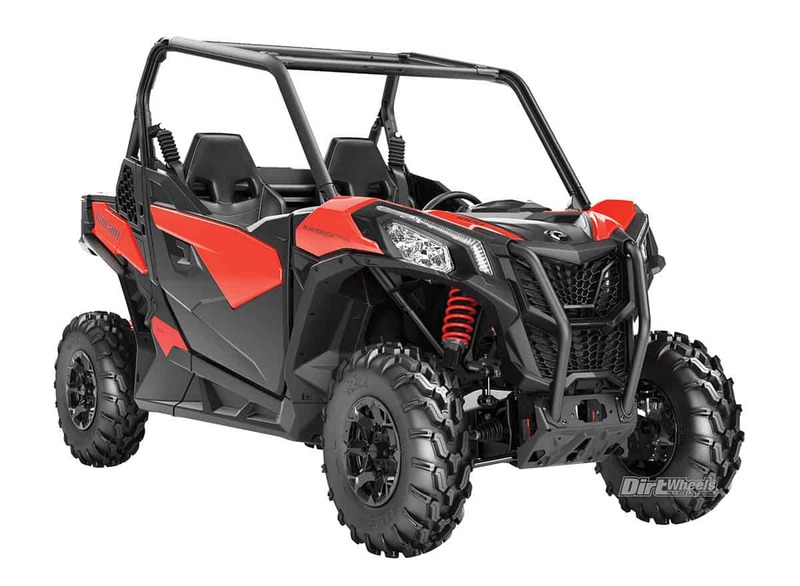 Engine type OHV V-twin, Displacement 976cc, Suspension: Front Dual A-arm/N/A, Rear Dual A-arm/N/A, Length/width/height 123.0”/67.0”/78.0”, Fuel capacity 7.3 gal., Dry weight 1697 lb., Towing 1200 lb., Bed capacity 1000 lb., Price $13,999. 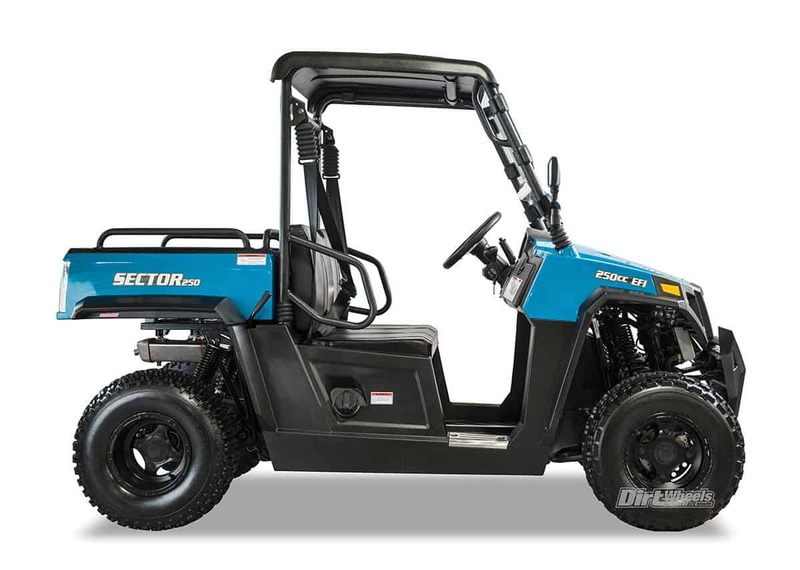 If you want a work-oriented UTV that can still be fun, the Sector line is a fairly inexpensive, fully decked-out way to go. The Sector 1000 Crew comes as an EFI, 976cc, V-twin four-stroke engine paired to a CV transmission. There is a two-seat version of this machine for $13,999, and both models come in a 750 option as well for $9999 and up. 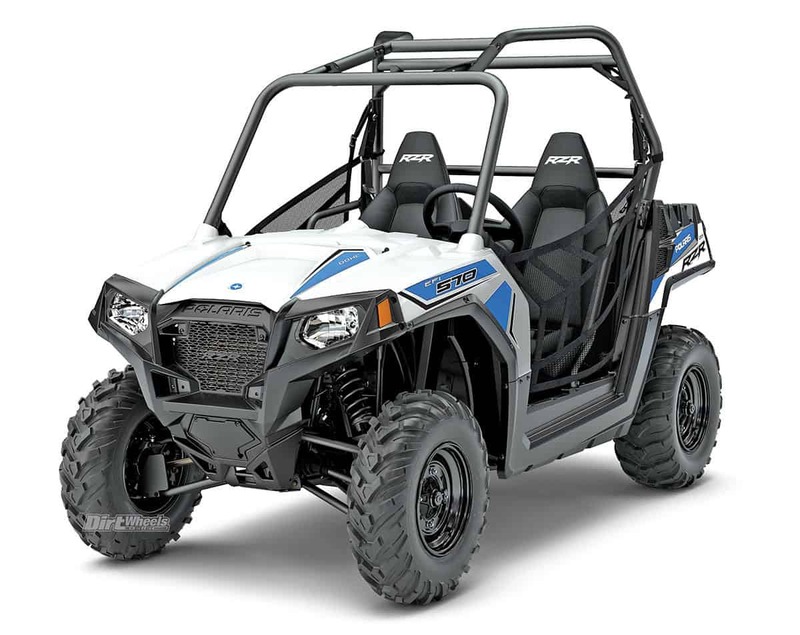 Engine type OHV V-twin, Displacement 976cc, Suspension: Front Dual A-arm/N/A, Rear Dual A-arm/N/A, Length/width/height 155.0”/65.0”/78.0”, Fuel capacity 7.3 gal., Dry weight 1881 lb., Towing 2000 lb., Bed capacity 1000 lb., Price $15,999. 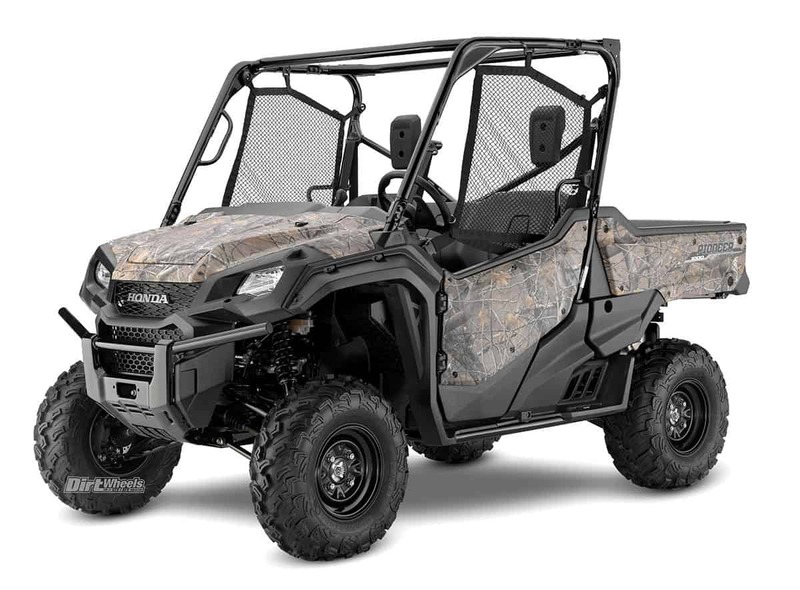 The Hisun Sector 750 has a 735cc single-cylinder engine rather than the V-twin that the 800 and 1000 use. The big single is electronically fuel injected. The towing capacity is 1500 pounds, and there is a 7.3-gallon fuel tank. The transmission is a fully automatic CVT with shaft drive. A 3500-pound winch and other handy features that are accessories for other brands comes standard. 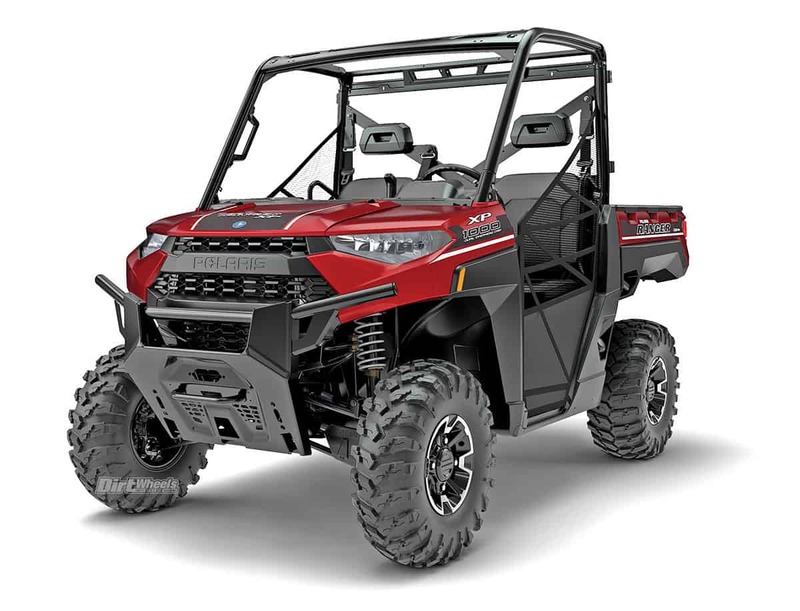 Engine type OHV single, Displacement 735cc, Suspension: Front Dual A-arm/N/A, Rear Dual A-arm/N/A, Length/width/height 155.0”/65.0”/74.0”, Fuel capacity 7.3 gal., Dry weight 1697 lb., Towing 1500 lb., Bed capacity 500 lb., Price $9,999. 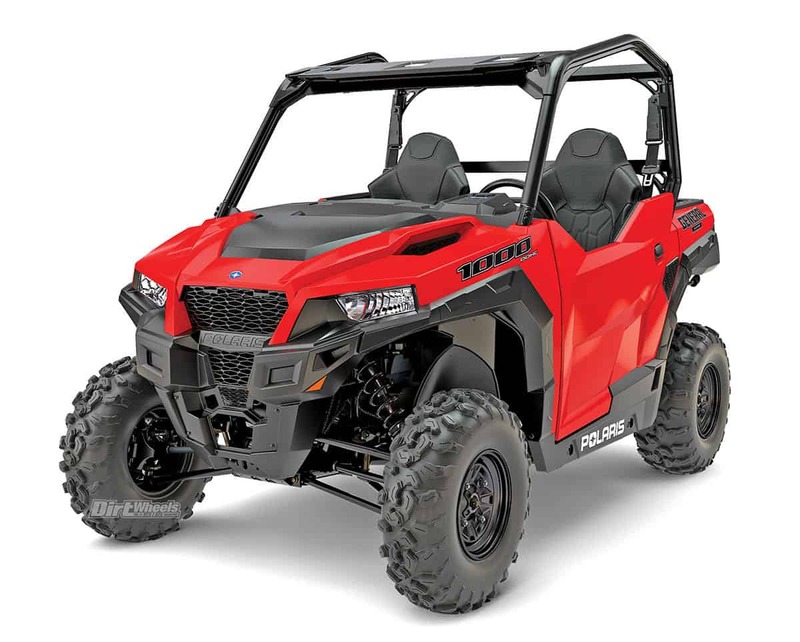 Engine type OHV single, Displacement 546cc, Suspension: Front Dual A-arm/N/A, Rear Dual A-arm/N/A, Length/width/height 119.0”/61.0”/76.0”, Fuel capacity 7.3 gal., Dry weight 1406 lb., Towing 1200 lb., Bed capacity 500 lb., Price $8,999. 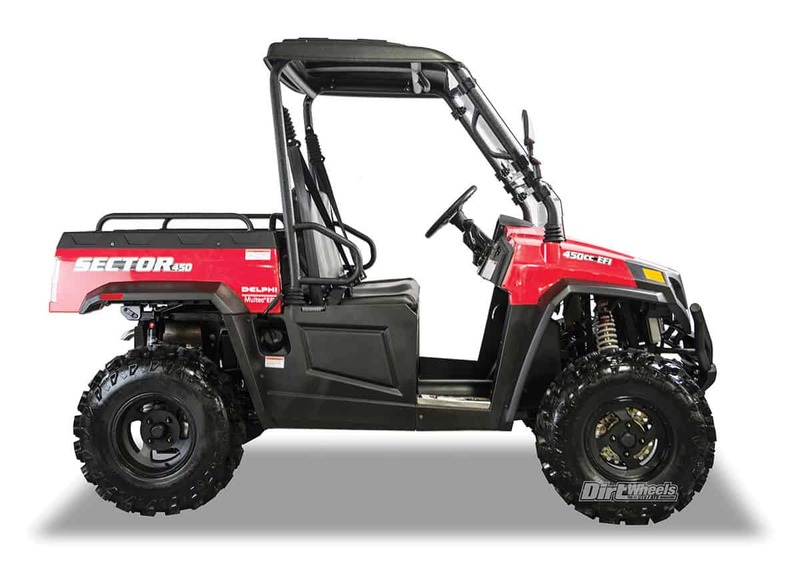 The Sector 450 is one mid-sized UTV with all the features of a full-size UTV. It comes standard with a roof, windshield, side mirrors, turn signals, winch and aluminum wheels. 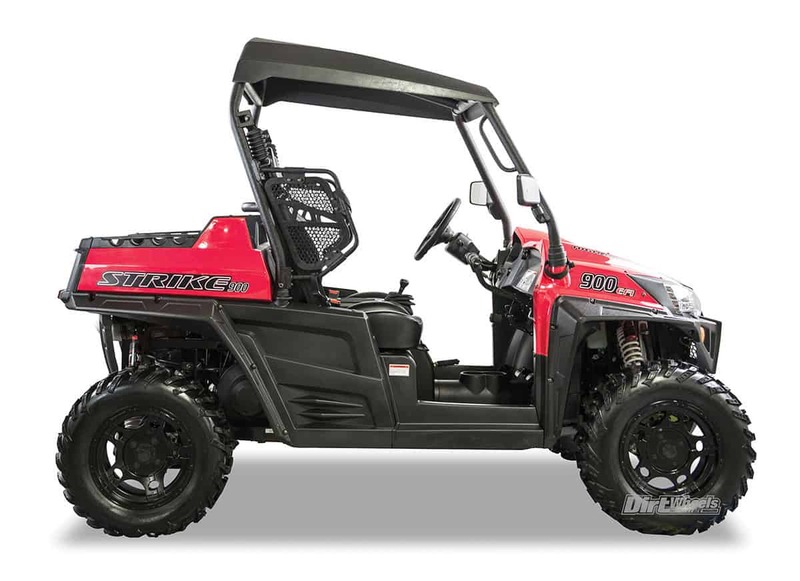 Packed with a 454cc, single-cylinder EFI engine with four-wheel drive to help get you to your desired destination. Dual-A-arm nitrogen-assisted shocks handle the suspension duties. 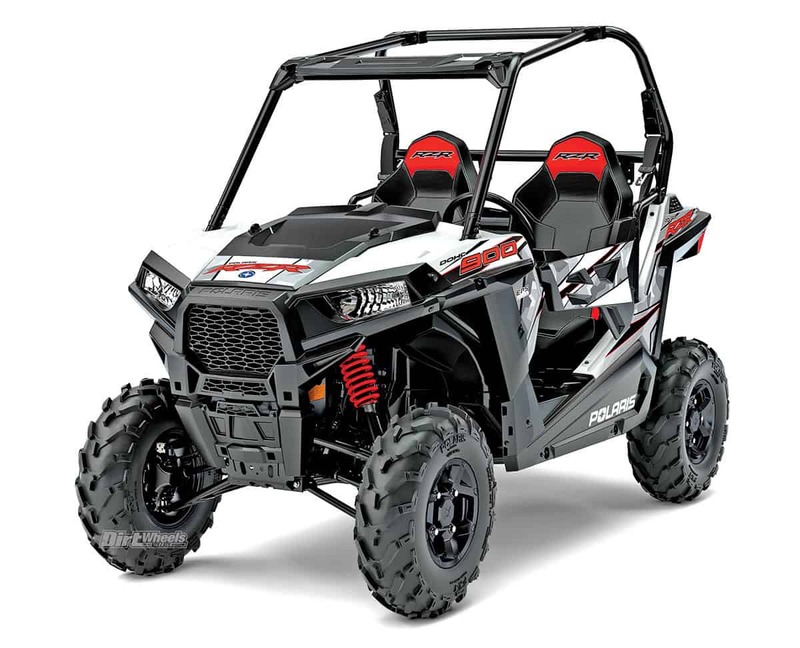 Engine type OHV single, Displacement 454cc, Suspension: Front Dual A-arm/N/A, Rear Dual A-arm/N/A, Length/width/height 107.0”/61.0”/74.0”, Fuel capacity 7.3 gal., Dry weight 1300 lb., Towing 1200 lb., Bed capacity 350 lb., Price $7,499. The Sector 250 is a snug fit for two adults. It comes fully featured with a roof, windshield, lights, front bumper, rear-view mirrors, half doors and a winch. It has cool aluminum wheels as well. An EFI, 229cc, single-cylinder four-stroke engine powers the Sector. The most recent update was 33-percent-lower gearing for 2017. The $4699 Strike 250 is another machine in Hisun’s lineup. 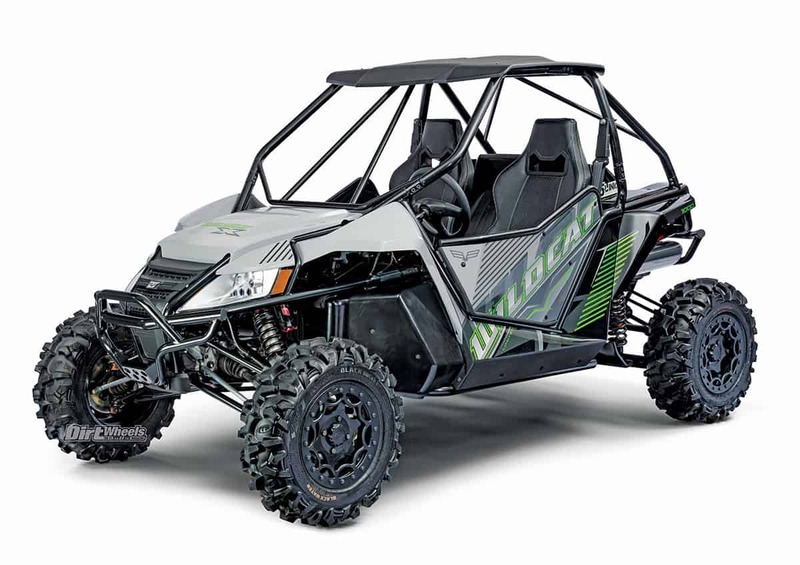 Engine type OHV single, Displacement 229cc, Suspension: Front Dual A-arm/N/A, Rear Swingarm/N/A, Length/width/height 96.0”/49.0”/65.0”, Fuel capacity 3.5 gal., Dry weight 657 lb., Towing N/A, Bed capacity 110 lb., Price $4,799. Engine type Uni-Cam twin, Displacement 999cc, Suspension: Front Dual A-arm/10.6”, Rear Dual A-arm/10.0”, Length/width/height 116.8”/62.9”/76.4”, Fuel capacity 7.9 gal., Dry weight 1709 lb. Towing 2000 lb., Bed capacity 1000 lb., Price $14,499–$20,299. 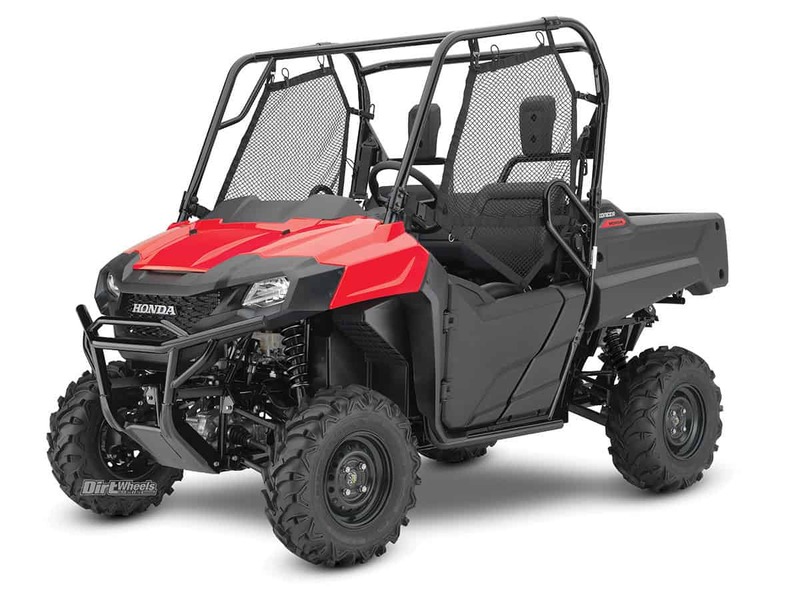 Honda’s Pioneer 1000-5 sports an EFI, 999cc, twin-cylinder, four-stroke engine paired with a belt-less six-speed automatic transmission. It can be driven in full auto or paddle-shifted. Self-leveling rear suspension keeps it riding at stock height when loaded. Flip-up seats in the bed make it a five-passenger. A Deluxe model is available for $17,699 and the Fox shocked, i4WD LE model is $21,899. 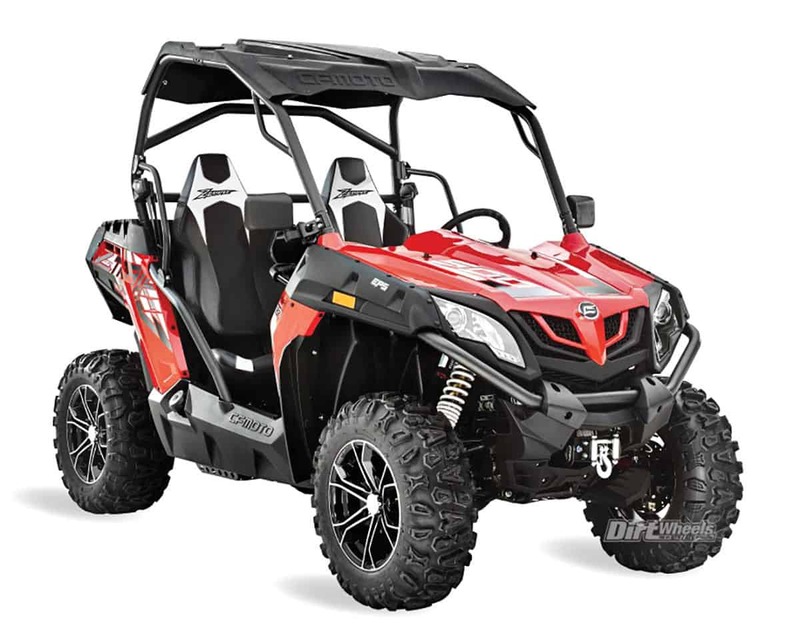 Engine type Uni-Cam twin, Displacement 999cc, Suspension: Front Dual A-arm/10.6”, Rear Dual A-arm/10.0”, Length/width/height 116.8”/63.0”/76.0”, Fuel capacity 7.9 gal., Dry weight 1526 lb., Towing 2000 lb., Bed capacity 1000 lb., Price $16,699–$21,899. Engine type OHV single, Displacement 675cc, Suspension: Front Dual A-arm/7.9”, Rear Dual A-arm/9.1, Length/width/height 114.8”/60.0”/77.6”, Fuel capacity 8.2 gal., Dry weight 1268 lb., Towing 1500 lb., Bed capacity 1000 lb., Price $10,599–$12,099. The Pioneer 700-4 is a capable machine that seats four people with two seats that fold up from the bed. With the bed seats down, you get a full work bed. It carries a quiet, efficient, EFI, 675cc four-stroke engine paired with a three-speed automatic transmission. It can tow 1500 pounds and haul 1000 pounds. Four-wheel independent suspension has over 9 inches of wheel travel in the rear for a smooth ride. The Deluxe model costs $13,699. 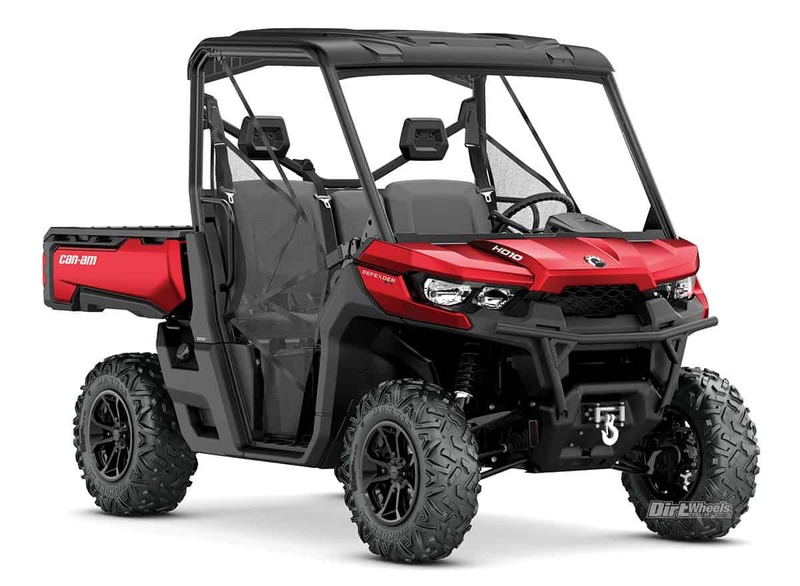 Engine type OHV single, Displacement 675cc, Suspension: Front Dual A-arm/7.9”, Rear Dual A-arm/9.1, Length/width/height 114.8”/60.0”/77.6”, Fuel capacity 8.2 gal., Dry weight 1411 lb., Towing 1500 lb., Bed capacity 1000 lb., Price $12,299. 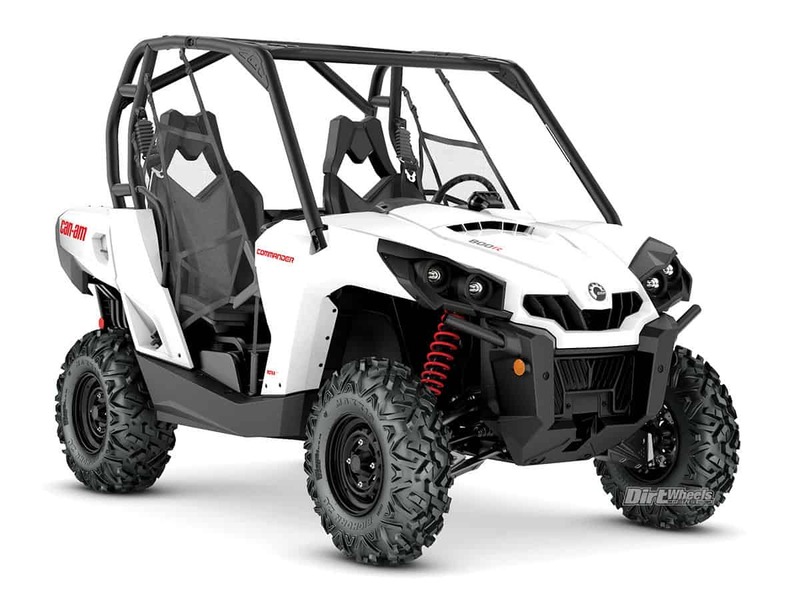 Honda’s Pioneer 500 is its smallest UTV, and it can fit on 50-inch-wide trails. 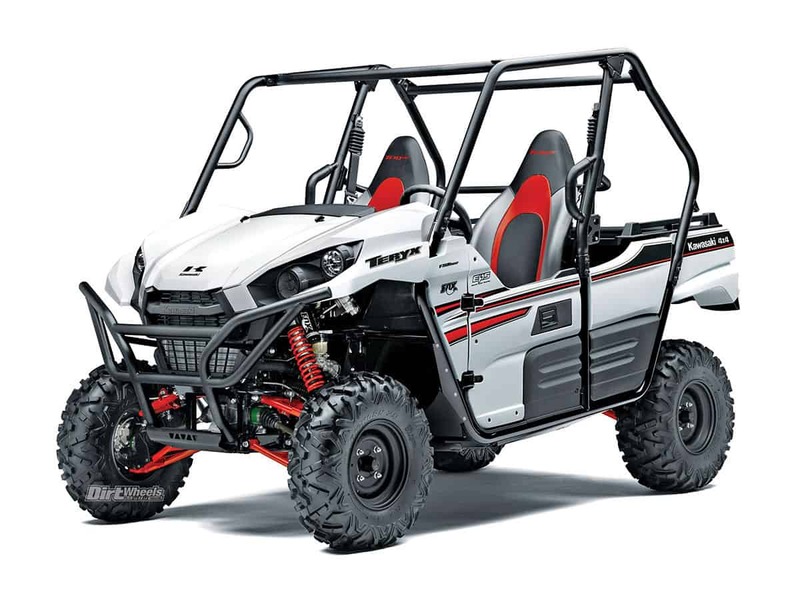 It’s appropriate that it is narrow enough for quad trails, and it shares the 475cc four-stroke engine paired with a five-speed auto transmission drivetrain from Honda’s 4×4 quads. Select either paddle-shifting manual or full-auto mode. Wheel travel of 5.9 inches comes through double-wishbone suspension. It tows 1000 pounds and has a rear cargo rack. 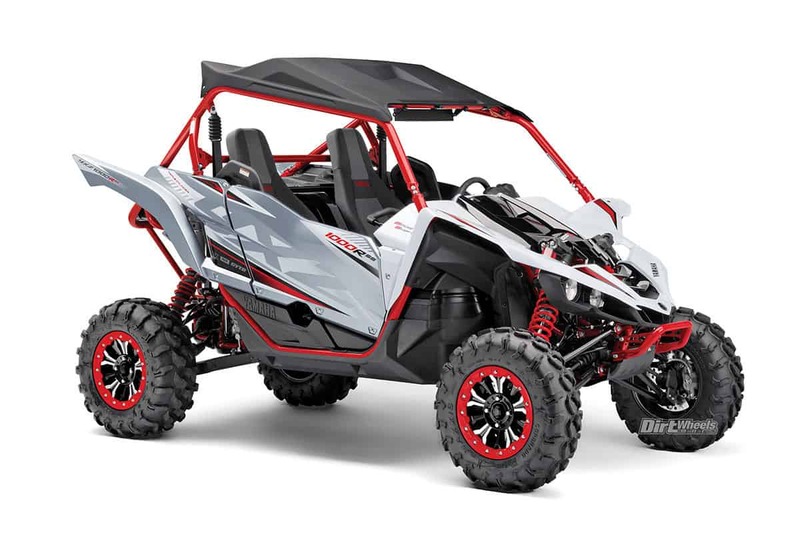 Engine type OHV single, Displacement 475cc, Suspension: Front Dual A-arm/5.9”, Rear Dual A-arm/5.9, Length/width/height 102.6”/50.0”/71.3”, Fuel capacity 4.1 gal., Dry weight 1025 lb., Towing 1000 lb., Bed capacity 450 lb., Price $8,999. 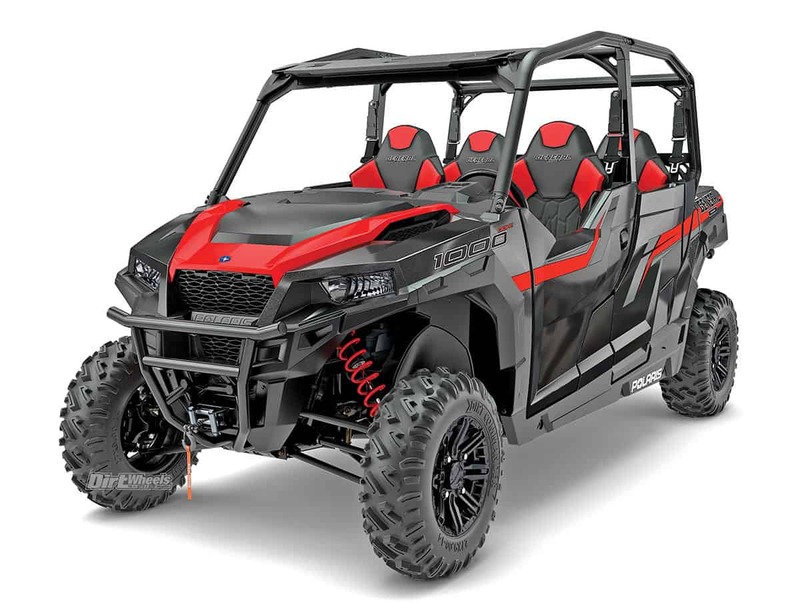 Intimidator is a newer company to the UTV industry, and this is their newest offering in the recreational utility department. The GC1K sports a 997cc, liquid-cooled four-stroke engine that is paired to an auto atic CV-style transmission. Each corner of the machine can utilize up to 10 inches of suspension travel. 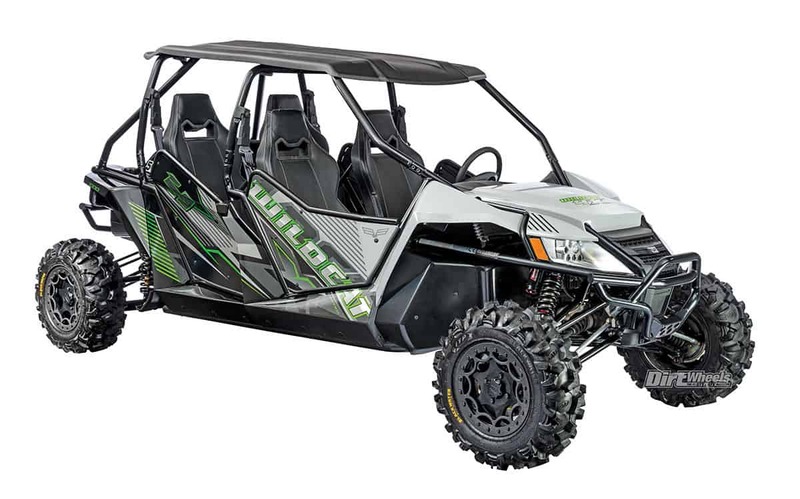 Engine type OHV twin, Displacement 997cc, Suspension: Front Dual A-arm/10.0”, Rear Dual A-arm/10.0”, Length/width/height 122.0”/64.0”/79.5”, Fuel capacity N/A, Dry weight 1850 lb., Towing 2500 lb., Bed capacity 1000 lb., Price $15,399. Engine type Twin, Displacement 800cc, Suspension: Front Dual A-arm/10.0”, Rear Dual A-arm/10.0”, Length/width/height 117.0”/72.0”/83.0”, Fuel capacity 9.0 gal., Dry weight 1819 lb., Towing 2300 lb., Bed capacity 1000 lb., Price $21,449. Engine type N/A, Displacement N/A, Suspension: Front Dual A-arm/10.0”, Rear Dual A-arm/10.0”, Length/width/height 113.0”/63.0”/78.0”, Fuel capacity 9.0 gal., Dry weight 1571 lb., Towing 2100 lb., Bed capacity 1200 lb., Price $12,099. If you have a need to take a crew of workers, family or friends around the job or trails, the Intimidator Crew is a sturdy option. It seats six and comes with a 1000cc diesel, 800cc gas or 750cc gas engine. Suspension travel is a healthy 10 inches on each corner, and it utilizes a two- and four-wheel-drive system. Engine type N/A, Displacement N/A, Suspension: Front Dual A-arm/10.0”, Rear Dual A-arm/10.0”, Length/width/height 149.0”/63.0”/78.0”, Fuel capacity 9.0 gal., Dry weight 1952 lb., Towing 2100 lb., Bed capacity 1200 lb., Price $13,749. 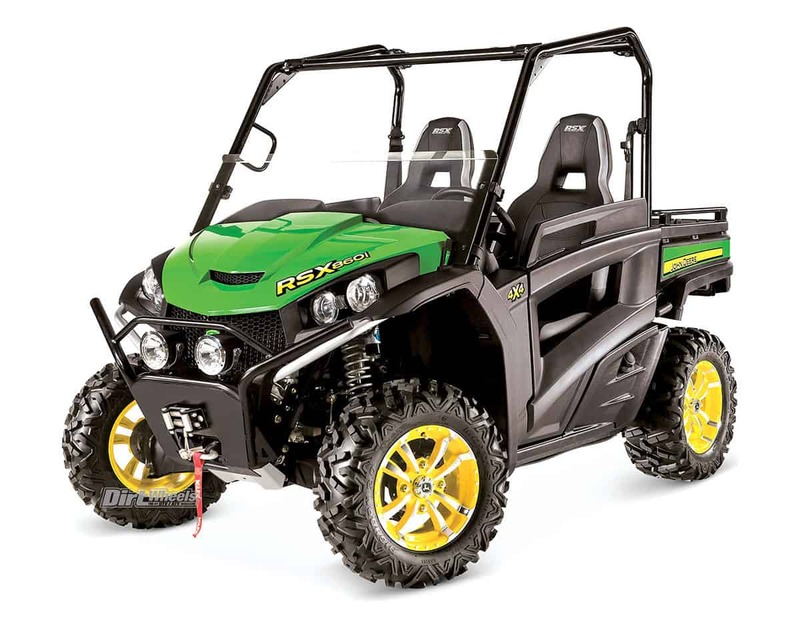 John Deere had three different versions of the sport-oriented RSX850i and the more powerful RSX860i. That has dwindled to just the RSX860i in 2018. It comes with what JD describes as an Italian motorcycle engine with 62-horsepower paired with an automatic CV transmission. 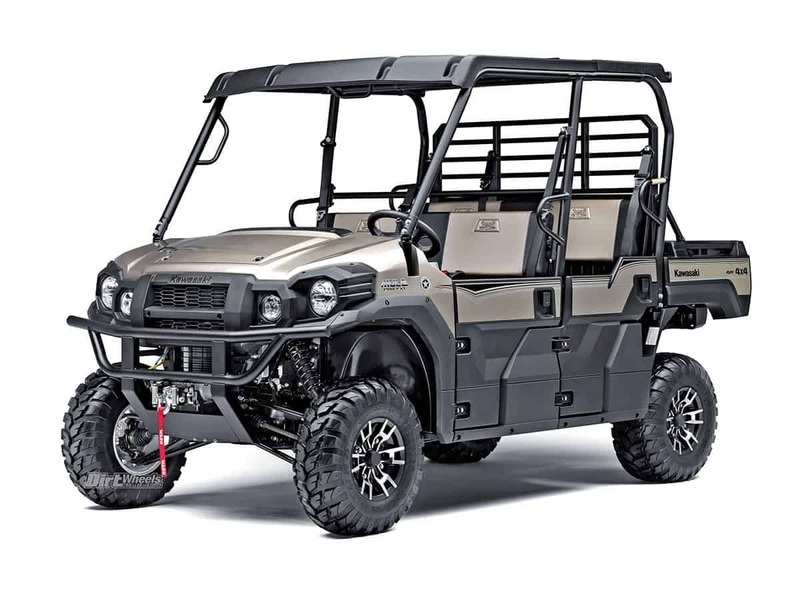 The Sport model adds a heavy-duty front bumper, winch and aluminum wheels for $14,699. The Trail version runs $14,749, and a more powerful RSX860i is $13,464 with EPS available. Engine type Four-valve V-twin, Displacement 839cc, Suspension: Front Dual A-arm/9.0”, Rear Multi-link semi-trailing arm/9.0”, Length/width/height 90.0”/48.0”/68.0”, Fuel capacity 7.4 gal., Dry weight 1430 lb., Towing 1200 lb., Bed capacity 800 lb., Price Starting at $12,299. Engine type 4-valve V-twin, Displacement 570-839cc, Suspension: Front Dual A-arm/8.0”, Rear Dual A-arm/8.0”, Length/width/height 115.0”/48.0”/74.0”, Fuel capacity 7.4 gal., Dry weight 1430 lb., Towing 1100 lb., Bed capacity 400 lb., Price Starting at $8,139. This well-equipped machine is the top crew vehicle in John Deere’s lineup. It comes with a half windshield, roof with extra lights, heavy-duty bumpers, a winch and aluminum wheels. EPS comes standard on the S4. It seats four and has a cargo box that can hold up to 1000 pounds. It’s powered by a diesel engine. 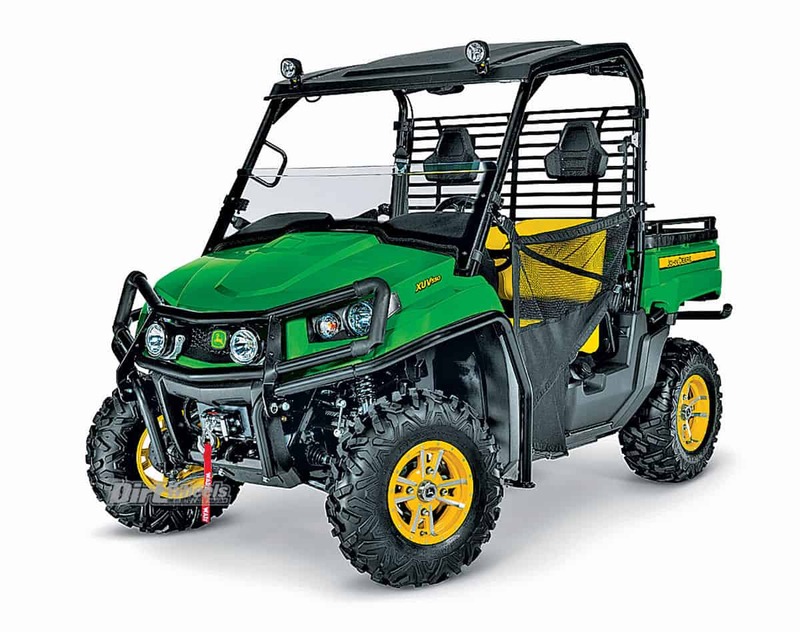 JD has a variety of other crew models with different gasoline engines. Engine type Diesel, Displacement 854cc, Suspension: Front Dual A-arm/8.0”, Rear Dual A-arm/8.0”, Length/width/height 144.0”/48.0”/74.0”, Fuel capacity 7.4 gal., Dry weight 1497 lb., Towing 1100 lb., Bed capacity 400 lb., Price $16,099. 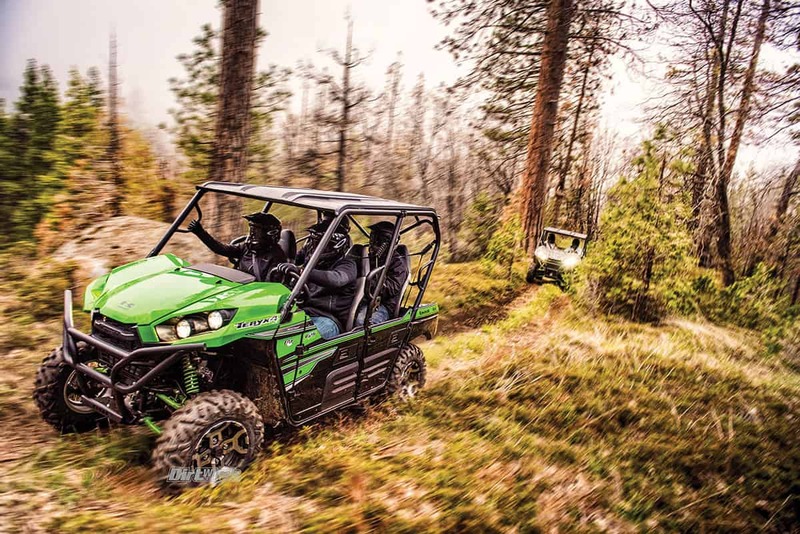 The Kawasaki Teryx shares a lot of the same features as its four-seater counterpart, including its short length to fit on tighter trails. EPS is standard, as are three-tone bucket seats. The 4×4 system has an electronic-locking front differential. A camo model and an LE model are available. 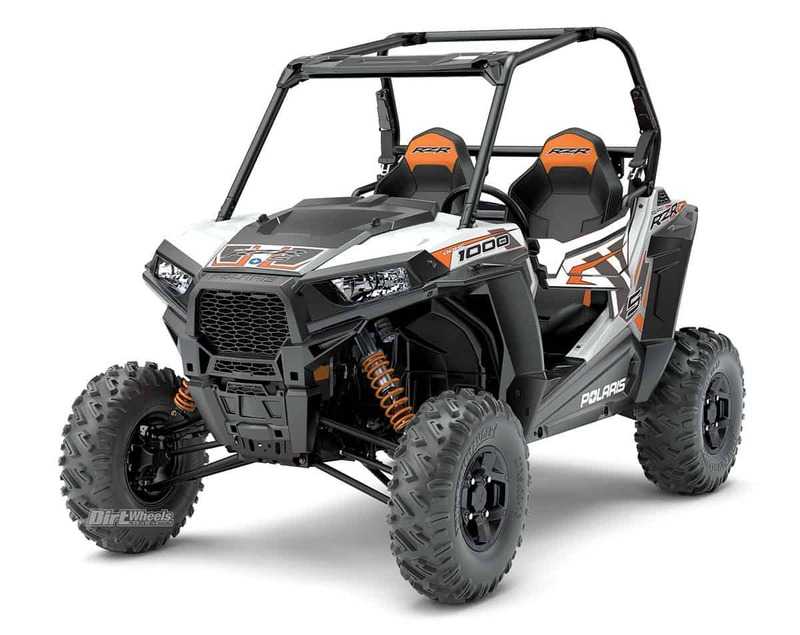 Engine type OHV V-twin, Displacement 783cc, Suspension: Front Dual A-arm/8.0”, Rear Dual A-arm/8.3”, Length/width/height 118.1”/61.6”/75.8”, Fuel capacity 7.9 gal., Dry weight 1569 lb., Towing 1300 lb., Bed capacity 600 lb., Price $12,999. 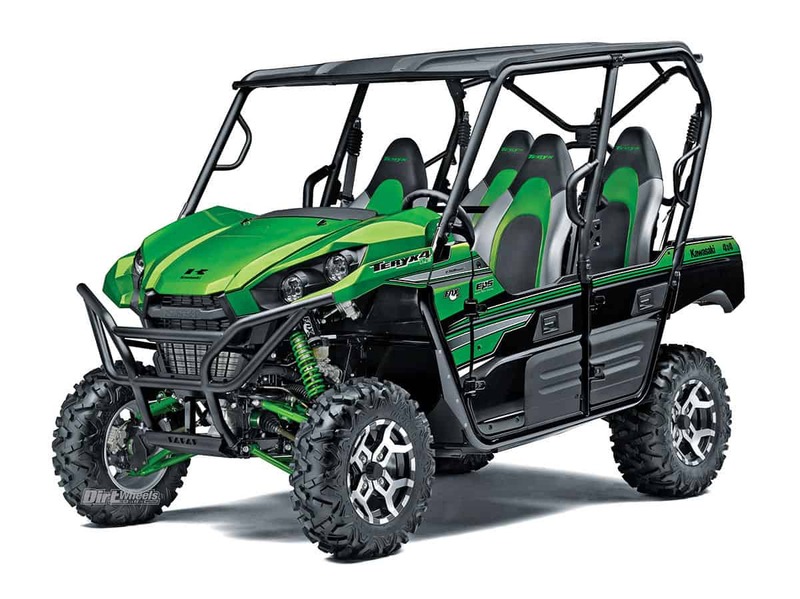 The Kawasaki Teryx4 sports a liquid-cooled, EFI 783cc V-twin with CVT. The front suspension is dual- A-arm with Fox Podium shocks to provide a smooth ride. The rear suspension is independent and runs Fox shocks with 8.3 inches of wheel travel. There is a camo and LE version available. 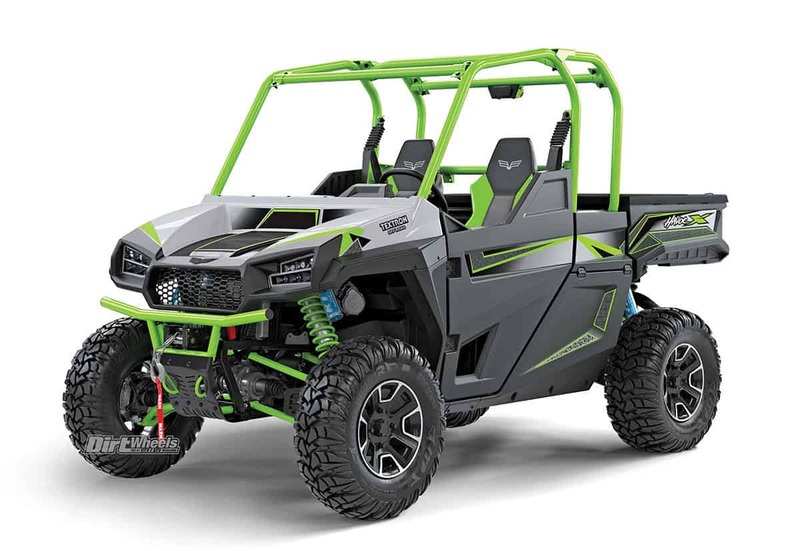 Engine type OHV V-twin, Displacement 783cc, Suspension: Front Dual A-arm/8.0”, Rear Dual A-arm/8.3”, Length/width/height 125.4”/61.6”/77.8”, Fuel capacity 7.9 gal., Dry weight 1604 lb., Towing 1300 lb., Bed capacity 249 lb., Price $15,799. 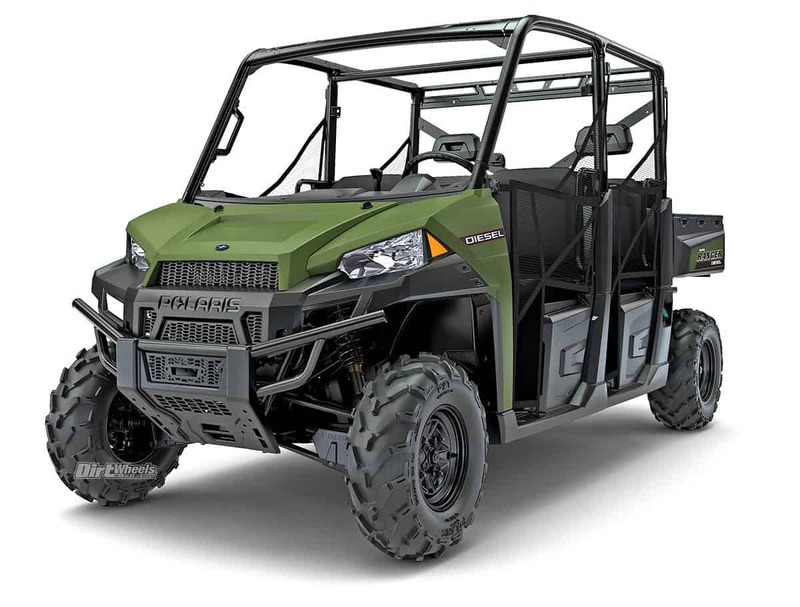 Kawasaki’s Mule Pro-FXR is the company’s newest UTV in their recreational utility lineup. It has a short wheelbase of 79.7 inches so it can fit on tight trails. It sports a triple-cylinder four-stroke engine that is liquid-cooled and paired to an automatic CV-style transmission. Electronic Power Steering comes standard on this machine. Engine type DOHC triple, Displacement 812cc, Suspension: Front Dual A-arm/8.7, Rear Dual A-arm/8.7, Length/width/height 121.5”/64.0”/77.2”, Fuel capacity 7.9 gal., Dry weight 1768 lb., Towing 2000 lb., Bed capacity 1000 lb., Price $14,999. 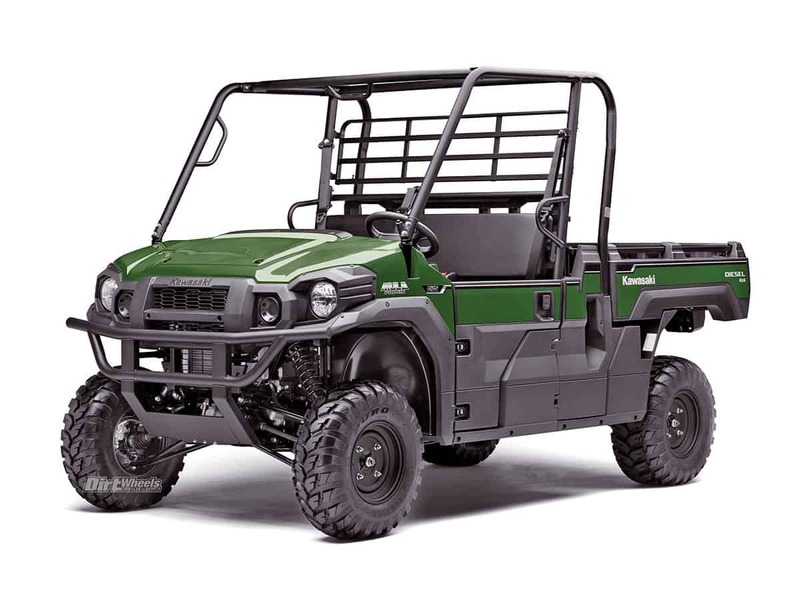 If you are searching for a three-seater utility-capable machine, the Kawasaki Mule Pro-FX is a solid choice. The cargo bed can hold up to 1000 pounds, and it can tow up to 2000 pounds. It has four-wheel double-wishbone suspension with over 8 inches of wheel travel for a smooth ride. The electronic power-steering version starts at $13,099. A camo, LE and Ranch Edition are available. Engine type DOHC triple, Displacement 812cc, Suspension: Front Dual A-arm/8.7”, Rear Dual A-arm/8.7”, Length/width/height 133.3”/64.0”/79.7”, Fuel capacity 7.9 gal., Dry weight 1832 lb., Towing 2000 lb., Bed capacity 1000 lb., Price $12,099. If you are in need of a pure-utility machine that can still tackle trails, check out the Mule line. This four-seater has a folding rear seat to provide even more cargo-bed room. 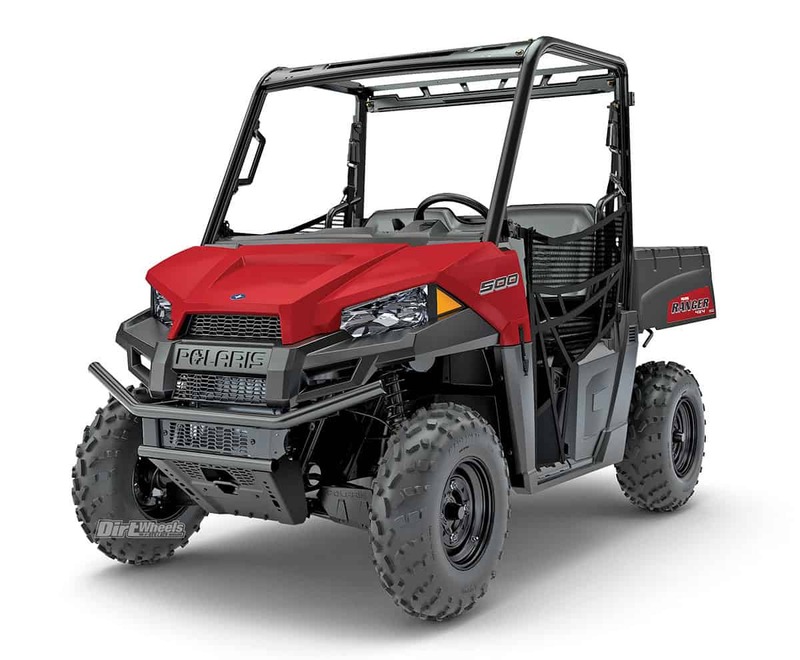 A 812cc, three-cylinder, four-stroke engine with CVT powers the Mule Pro-FXT. The EPS version goes for $14,799. There is a luxury version Ranch Edition for $16,999. Engine type DOHC triple, Displacement 812cc, Suspension: Front Dual A-arm/8.7”, Rear Dual A-arm/8.7”, Length/width/height 133.3”/64.0”/79.5”, Fuel capacity 7.9 gal., Dry weight 1962 lb., Towing 2000 lb., Bed capacity 1000 lb., Price $13,099. 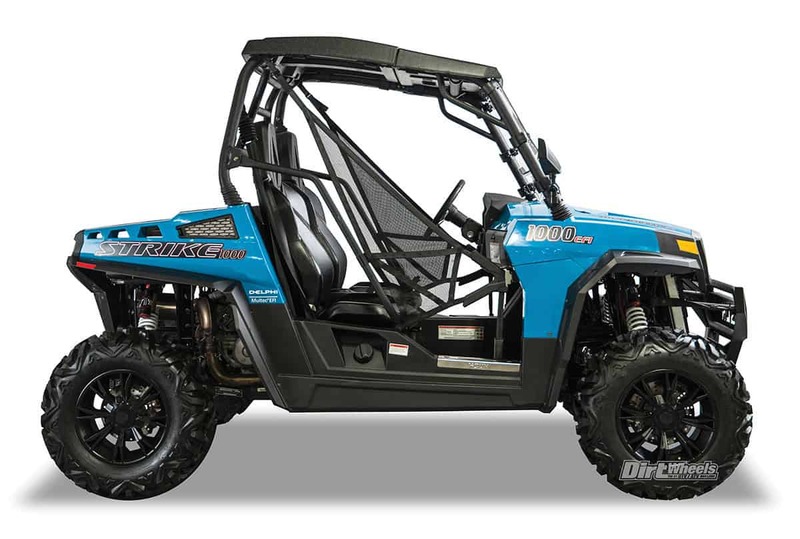 The Mule Pro-DX shares the same frame and features that the rest of the line does, but you can get it with a 993cc, four-stroke, diesel, three-cylinder engine. A fully automatic CVT is paired to the engine. 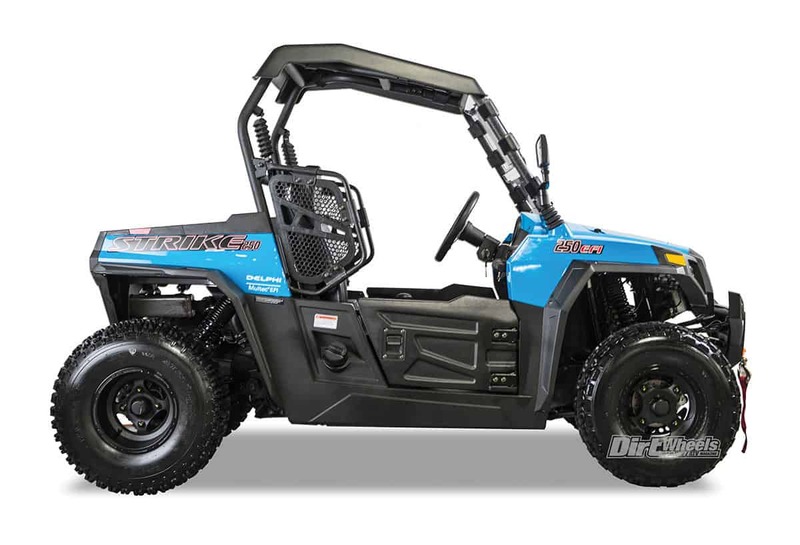 You can get a four-seat Mule Pro-DXT starting at $14,299. You can get the Pro-DX and Pro-DXT in EPS and LE versions. Engine type Diesel triple, Displacement 993cc, Suspension: Front Dual A-arm/8.7”, Rear Dual A-arm/8.7”, Length/width/height 133.3”/64.0”/77.4”, Fuel capacity 7.9 gal., Dry weight 1808 lb., Towing 2000 lb., Bed capacity 1000 lb., Price $13,199. 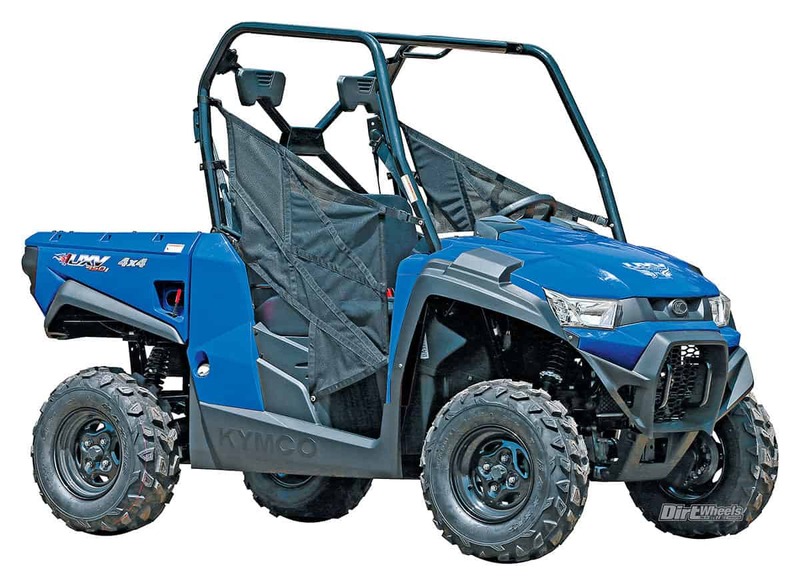 In addition to making parts for many off-road manufacturers, Kymco has its own capable recreational utility machines. The Kymco UXV 700i is powered by a 695cc, fuel-injected four-stroke engine paired with an automatic CVT. It has a locking front differential. There is a $10,999 Hunter model and a new Prime model for the same price. Engine type SOHC single, Displacement 695cc, Suspension: Front Dual A-arm/7.5”, Rear Dual A-arm/7.5”, Length/width/height 113.0”/59.0”/74.8”, Fuel capacity 8.4 gal., Dry weight 1218 lb., Towing 1200 lb., Bed capacity 420 lb., Price $8,999. The Kymco UXV 500i shares the same frame as the 700i. It carries an EFI, 501cc four-stroke engine paired with an automatic CVT. The front and rear suspension are dual A-arm in design, and hydraulic disc brakes help slow the machine down on the front and rear. The 500 Generator model is not offered for 2018. Engine type DOHC single, Displacement 501cc, Suspension: Front Dual A-arm/7.5”, Rear Dual A-arm/7.5”, Length/width/height 113.0”/59.0”/73.8”, Fuel capacity 8.4 gal., Dry weight 1157 lb., Towing 1200 lb., Bed capacity 420 lb., Price $8,299. Kymco’s smallest UTV engine is in the UXV 450i. It has a torquey, EFI, 443cc, four-stroke engine that is liquid-cooled. It comes with a front-locking differential. It can tow 1200 pounds, and the tilting cargo bed can hold 420 pounds. It comes in a new LE Prime model, a Hunter, Limited Edition, Turf and camo model as well. 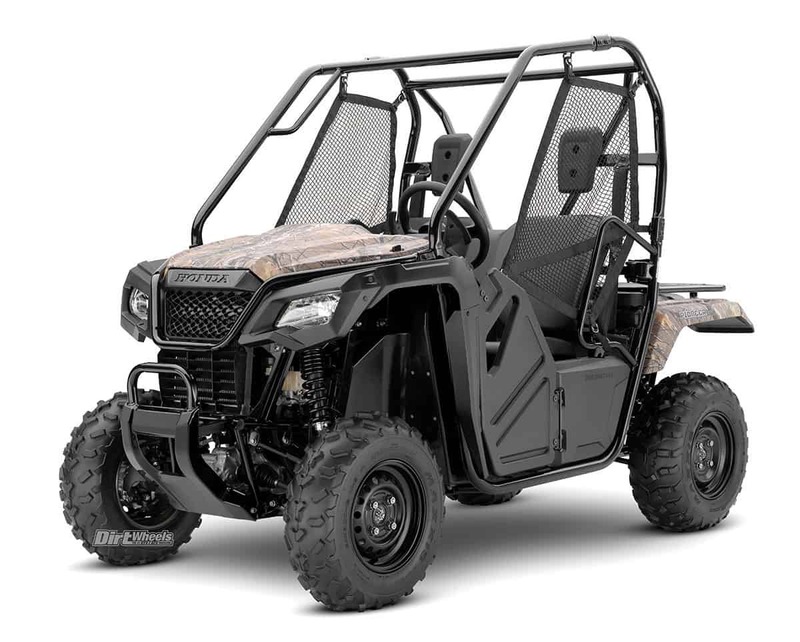 Engine type SOHC single, Displacement 443cc, Suspension: Front Dual A-arm/7.5”, Rear Dual A-arm/7.5”, Length/width/height 106.3”/56.7”/72.8”, Fuel capacity 8.5 gal., Dry weight 1080 lb., Towing 1200 lb., Bed capacity 440 lb., Price $7,899. 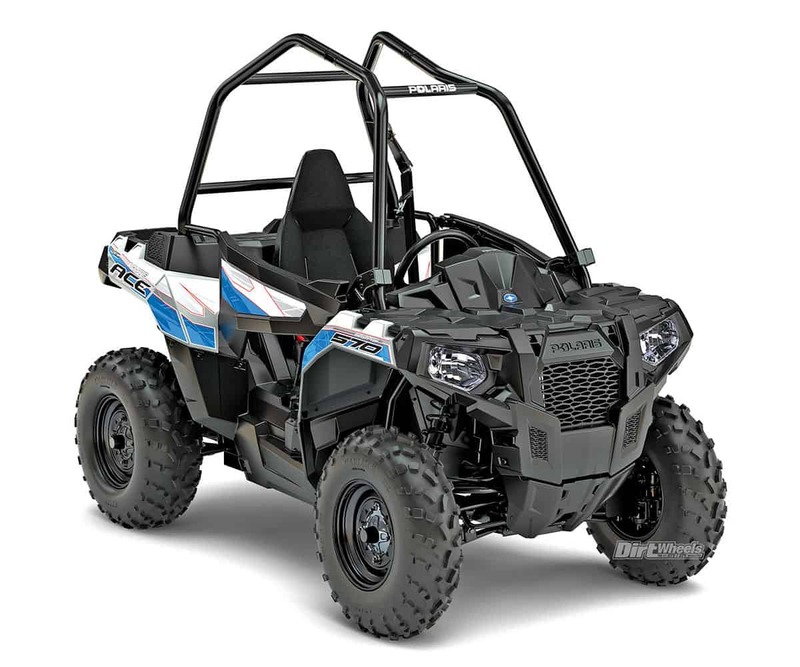 The Ravager LT Zues is Odes’ sportiest UTV. “Zeus” is the name given to Odes machines equipped with a 7-inch LCD touchscreen that multi-functions as a digital gauge display and a GPS screen. The beefy Vi-Lock suspension arms were designed by Desert Concepts, and the machine is powered by a 1000cc V-twin and a CVT. 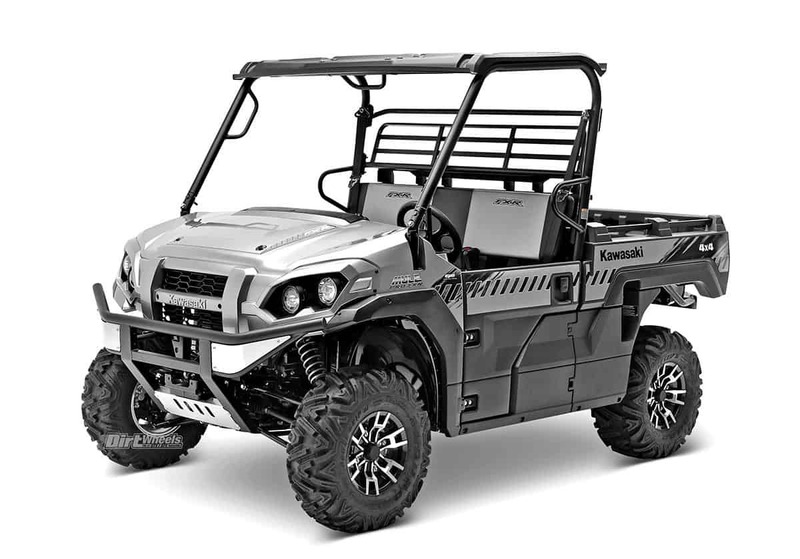 The Ravager is loaded with 15-inch wheels, 29-inch tires, heated seats, a windshield, roof, 32-inch LED light bar, doors and mirrors. It also has a winch, hitch, EPS, A-arm guards and radiator guards. Engine type DOHC V-twin, Displacement 1000cc, Suspension: Front Dual A-arm/14.0”, Rear Dual A-arm/14.0”, Length/width/height 106.0”/68.0”/81.0”, Fuel capacity N/A, Dry weight N/A, Towing 2200 lb., Bed capacity N/A, Price $16,495. Engine type DOHC V-twin, Displacement 800cc/1000cc, Suspension: Front Dual A-arm/14.0”, Rear Dual A-arm/14.0”, Length/width/height 118.0”/64.0”/79.0”, Fuel capacity N/A, Dry weight 1786 lb., Towing 2200 lb., Bed capacity N/A lb., Price Starting at $13,695. 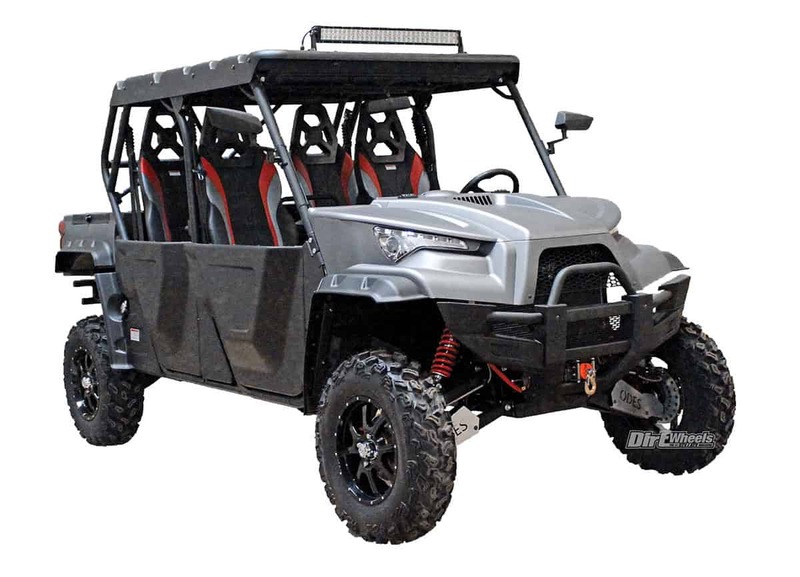 The Odes Dominator X4 four-seater UTV is the company’s biggest machine, and it is huge at 150 inches! It comes in two engine options—an 800cc and a 1000cc four-stroke V-twin—that are liquid-cooled and electronically fuel injected. This machine comes with great features for a reasonable price. A roof, windshield, 3500-pound winch, doors, LED light bars and more come standard. Engine type DOHC V-twin, Displacement 800cc/900cc, Suspension: Front Dual A-arm/14.0”, Rear Dual A-arm/14.0”, Length/width/height 150.0”/64.0”/79.0”, Fuel capacity N/A, Dry weight 1808 lb., Towing 2200 lb., Bed capacity N/A, Price $15,195. Engine type DOHC single, Displacement 650cc, Suspension: Front Dual A-arm/N/A, Rear Dual A-arm/N/A, Length/width/height 115.0”/55.0”/72.0”, Fuel capacity N/A, Dry weight 1146 lb., Towing 1200 lb., Bed capacity N/A lb., Price $7,995. 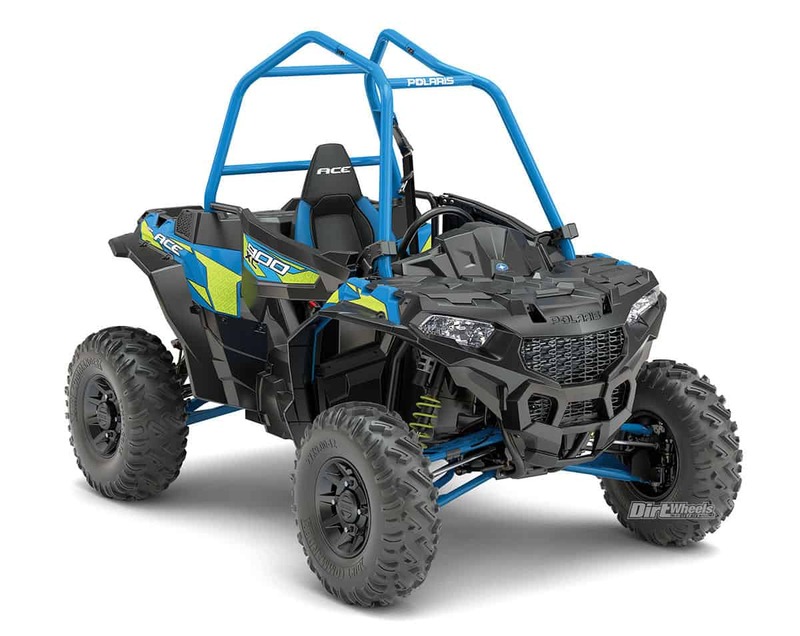 Engine type OHV single, Displacement N/A, Suspension: Front Dual A-arm/6.0”, Rear Swingarm/5.5”, Length/width/height 87”/47”/58”, Fuel capacity 2.1 gal., Dry weight 540 lb., Towing N/A, Bed capacity N/A, Price $3299.99. Engine type DOHC twin, Displacement 925cc, Suspension: Front Dual A-arm/16.0”, Rear Trailing Arm/18.0”, Length/width/height 119.0”/64.0”/73.7”, Fuel capacity 9.5 gal., Dry weight 1500 lb., Towing N/A, Bed capacity 300 lb., Price $25,999. 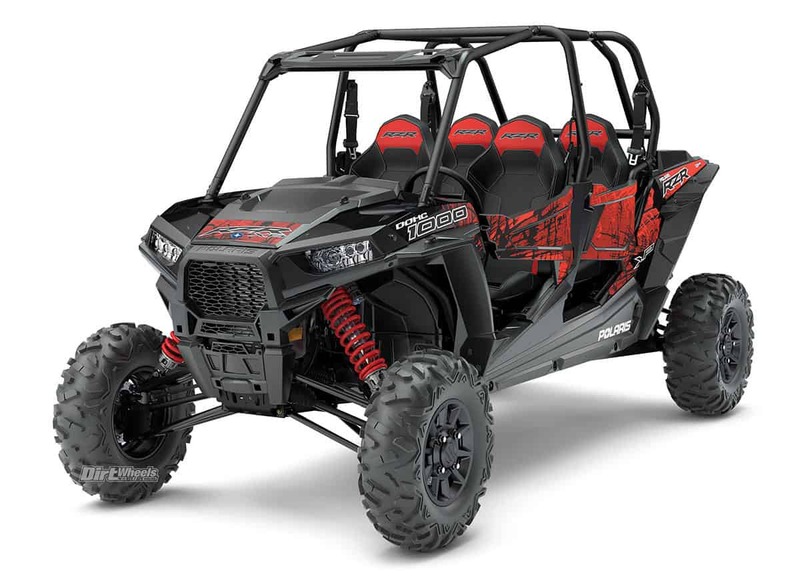 The RZR XP Turbo is fast and fun. It is a great all-around pure-sport machine out of the crate and now starts at a low price of $19,999 with a 168-horsepower turbo-inducted engine. The Fox Edition model is offered for $22,999 with 2.5 Podium internal bypass shocks up front and 3.0s in the rear. Suspension travel is a healthy 16 inches up front with 18 inches of travel in the rear. Engine type DOHC twin, Displacement 925cc, Suspension: Front Dual A-arm/16.0”, Rear Trailing arm/18.0”, Length/width/height 119.0”/64.0”/73.7”, Fuel capacity 9.5 gal., Dry weight 1500 lb., Towing N/A, Bed capacity 300 lb., Price $19,999. 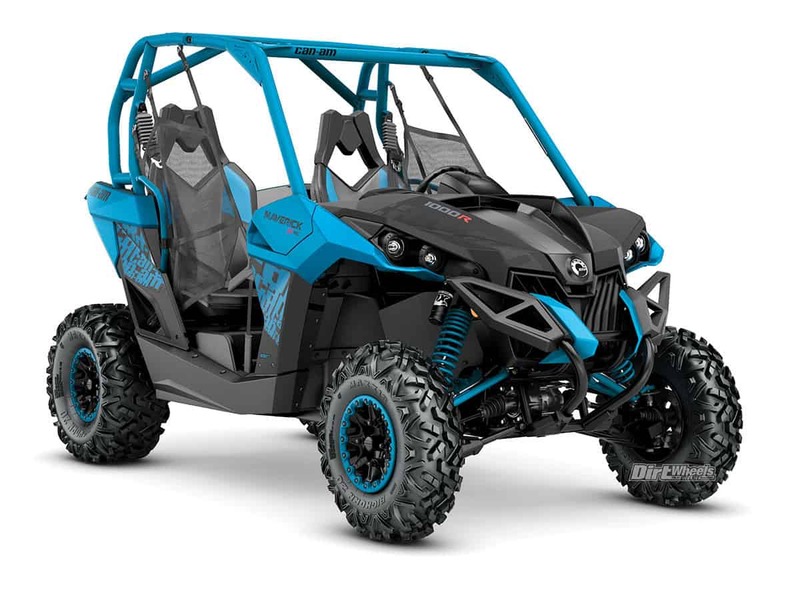 The RZR XP 4 Turbo comes in three flavors for 2018. The XP 4 Turbo comes with Walker Evans Racing suspension in a blue or orange scheme. There is a Fox Edition with more adjustable Fox Podium shocks in a red scheme, and finally the machine was just released with the Dynamix suspension and Ride Command outfit. Engine type DOHC twin, Displacement 925cc, Suspension: Front Dual A-arm/16.0”, Rear Trailing arm/18.0”, Length/width/height 146.0”/64.0”/73.7”, Fuel capacity 9.5 gal., Dry weight 1668 lb., Towing N/A, Bed capacity 300 lb., Price $22,499. Polaris and High Lifter have a great partnership with their competition-style mud machines. 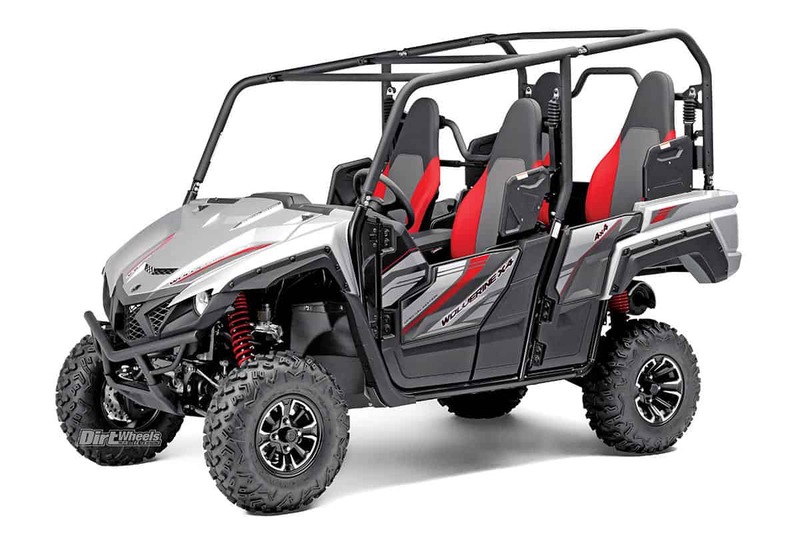 They also have a two-seat RZR XP 1000 HL Edition that goes for $21,199. Both have high-mount intakes and vents and 29.5-inch-tall High Lifter Outlaw 2 tires. For 2018 they changed the color scheme of the machine to black and orange. Engine type DOHC twin, Displacement 999cc, Suspension: Front Dual A-arm/16.0”, Rear Trailing arm/18.0”, Length/width/height 149.0”/64.0”/75.2”, Fuel capacity 9.5 gal., Dry weight 1752 lb., Towing N/A, Bed capacity 300 lb., Price $23,899. Engine type DOHC twin, Displacement 999cc, Suspension: Front Dual A-arm/16.0”, Rear Trailing arm/18.0”, Length/width/height 149.0”/64.0”/73.7”, Fuel capacity 9.5 gal., Dry weight 1565 lb., Towing N/A, Bed capacity 300 lb., Price $20,499. 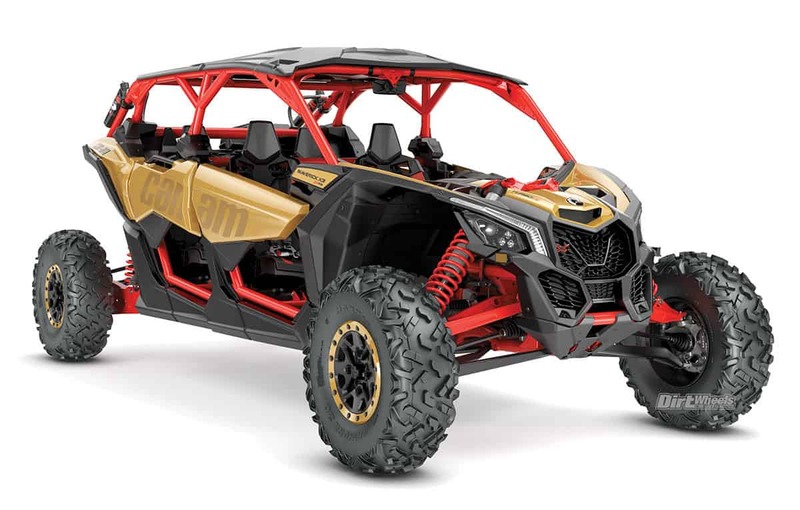 The special-edition Gold Metallic model is for rock-crawling enthusiasts. 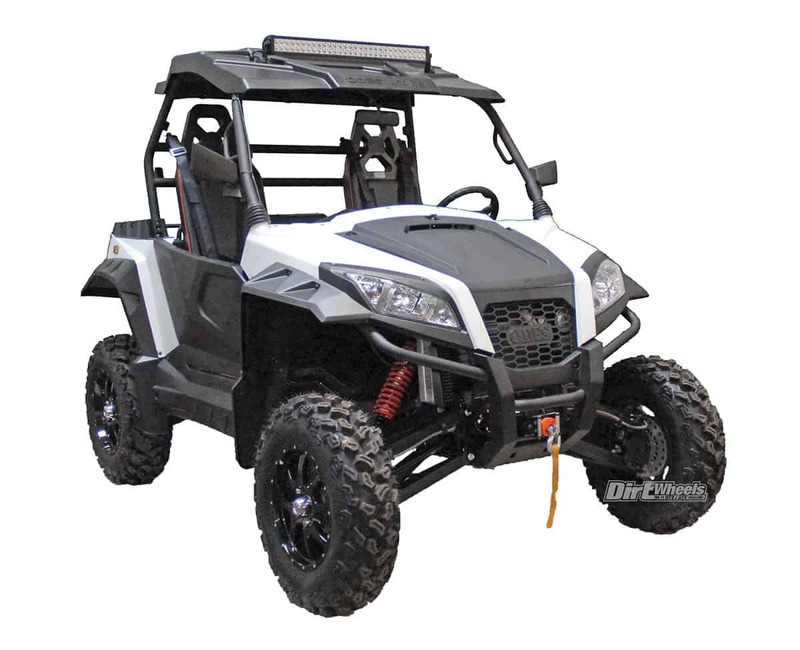 To start, this RZR comes with a front rock bumper, color-matched rock sliders and Polaris’ four-point harness system. Color-matched seats, beadlock wheels and 30-inch-tall Pro Armor Crawler XG tires come standard. A gated gear shifter helps you keep in the gear you want to be in, and there is a 55-percent-lower gearing in low. Engine type DOHC twin, Displacement 999cc, Suspension: Front Dual A-arm/16.0”, Rear Trailing arm/18.0”, Length/width/height 120.0”/64.0”/74.2”, Fuel capacity 9.5 gal., Dry weight 1567 lb., Towing N/A, Bed capacity 300 lb., Price $22,499. Engine type DOHC twin, Displacement 999cc, Suspension: Front Dual A-arm/16.0”, Rear Trailing arm/18.0”, Length/width/height 119.0”/64.0”/73.5”, Fuel capacity 9.5 gal., Dry weight 1379 lb., Towing N/A, Bed capacity 300 lb., Price $19,499. 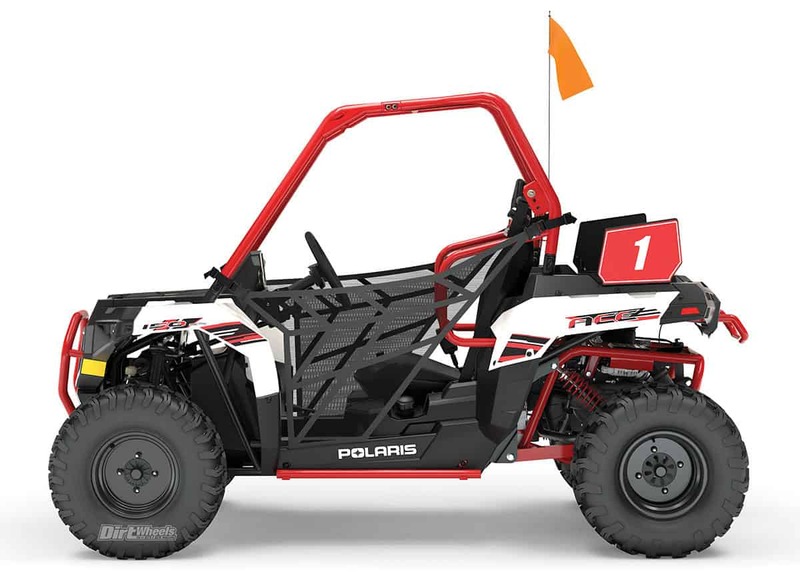 Polaris keeps the RZR S 1000 EPS model going for 2018. The 60-inch-wide S 900 was already a fast, well-handling machine, and giving it more power certainly adds to the fun factor. 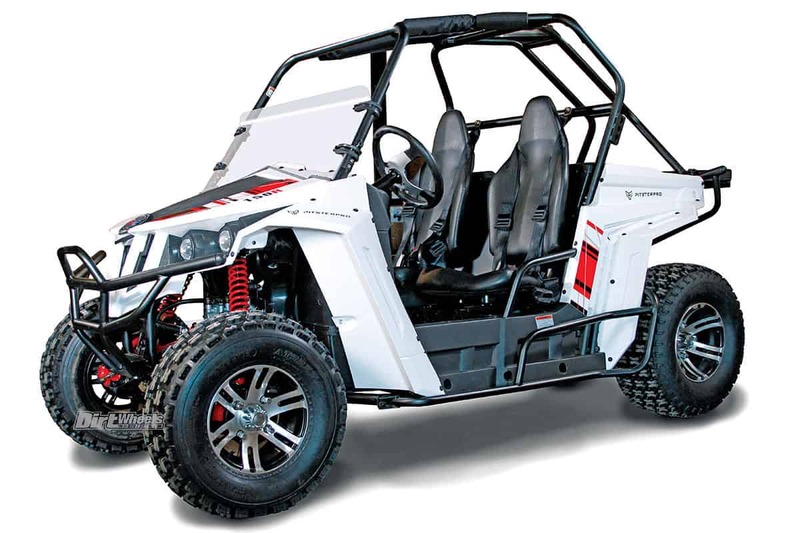 The RZR S line comes with four-wheel dual-A-arm suspension with over 12 inches of wheel travel. 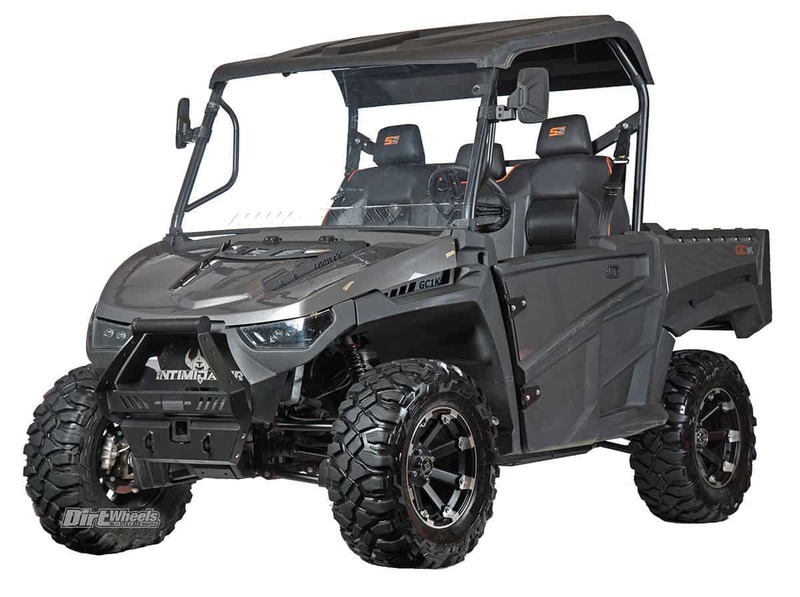 You can get the RZR S 900 without EPS for $14,699. Engine type DOHC twin, Displacement 875cc/999cc, Suspension: Front Dual A-arm/12.2”, Rear Dual A-arm/13.2”, Length/width/height 106.0”/60.0”/71.5”, Fuel capacity 9.5 gal., Dry weight 1204 lb., Towing 1500 lb., Bed capacity 300 lb., Price $14,699/$17,999. Engine type DOHC twin, Displacement 875cc, Suspension: Front Dual A-arm/12.2”, Rear Dual A-arm/13.2”, Length/width/height 138.1”/60.0”/71.7”, Fuel capacity 9.5 gal., Dry weight 1476 lb., Towing 1500 lb., Bed capacity 300 lb., Price $18,499. 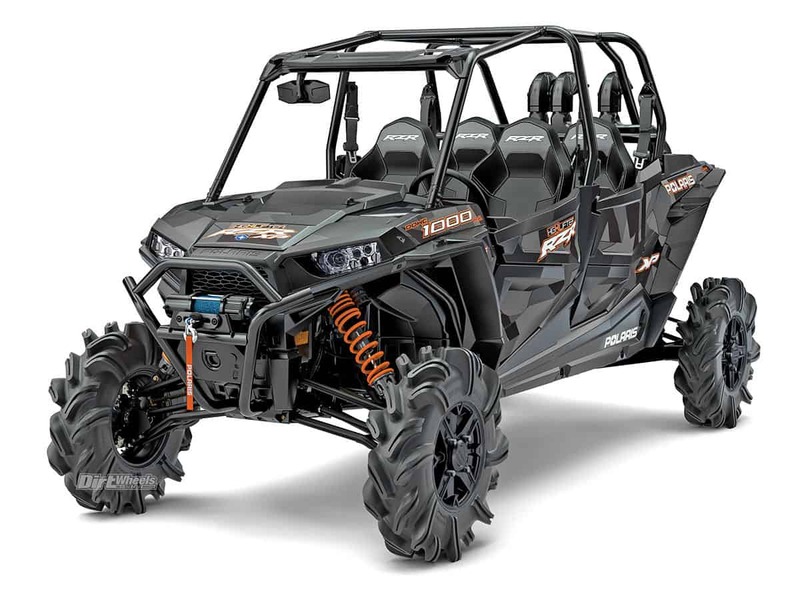 If you want power and performance to tackle tight trails and tricky terrain, the RZR 900 is a strong contender. It comes with a 50-inch width so it’s easy to maneuver in tight spaces. There is an EPS version of the 900 that comes with aluminum wheels and two different color schemes. The 900 four-stroke engine is potent and powerful. Engine type DOHC twin, Displacement 875cc, Suspension: Front Dual A-arm/10.0”, Rear Dual A-arm/10.0”, Length/width/height 105.0”/50.0”/69.5”, Fuel capacity 9.5 gal., Dry weight 1150 lb., Towing 1500 lb., Bed capacity 300 lb., Price $12,999/$14,799. 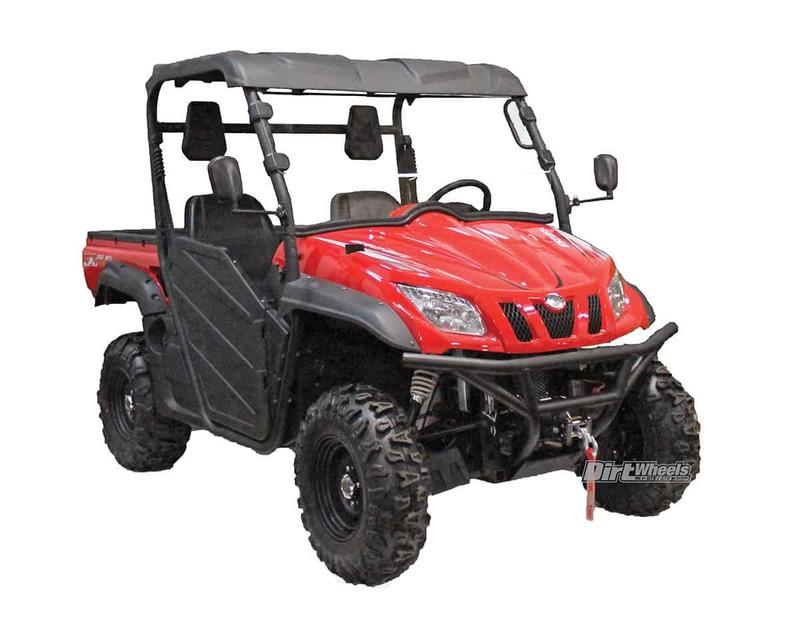 The RZR 570 carries a liquid-cooled EFI 567cc, single-cylinder, four-stroke engine. An automatic CVT transmission helps disperse power to the differentials. Four-wheel dual-A-arm suspension provides 8 inches of front wheel travel and 9.5 inches in the rear. You can get the 570 with electronic power steering for $12,299. Engine type DOHC Ssingle, Displacement 567cc, Suspension: Front Dual A-arm/9.0”, Rear Dual A-arm/9.5”, Length/width/height 107.5”/50.0”/69.0”, Fuel capacity 7.25 gal., Dry weight 996 lb., Towing 1500 lb., Bed capacity 300 lb., Price $10,299. Engine type OHV single, Displacement 169cc, Suspension: Front Single A-arm/5.0”, Rear Swingarm/5.0”, Length/width/height 85.0”/48.0”55.0”, Fuel capacity 2.5 gal., Dry weight 532 lb., Towing N/A, Bed capacity N/A, Price $4,799. 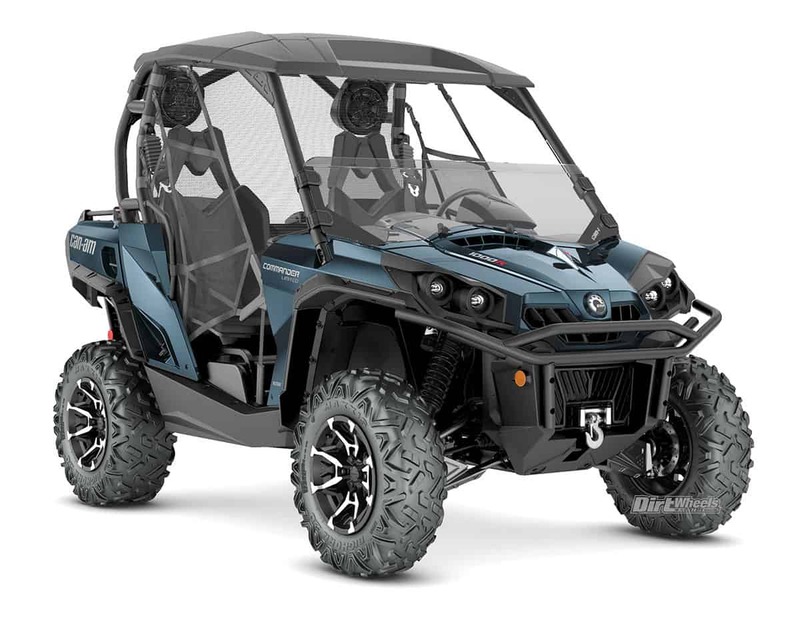 The 2018 Polaris Ace 900 XC carries a 78-horsepower ProStar 900 engine that is electronically fuel injected and very powerful. 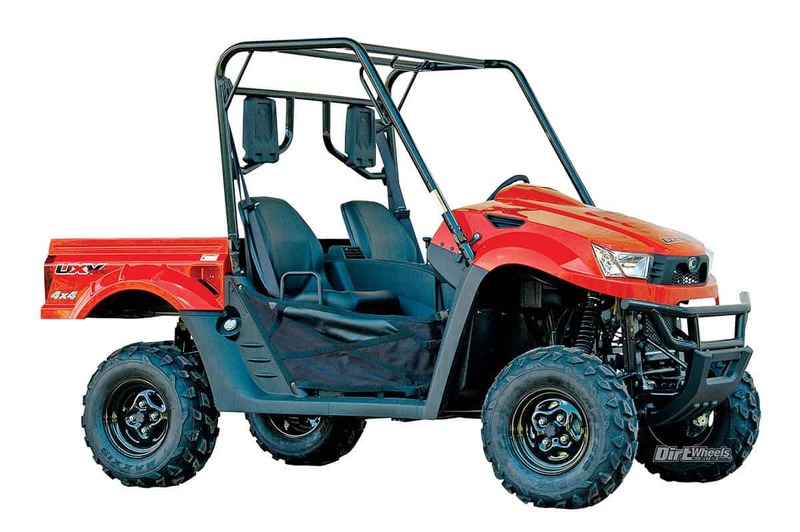 The 900 XC is 59 inches wide through the use of dual-A-arm front and rear suspension. There is over 12 inches of suspension travel on all four wheels that does a great job soaking up chop and tackling rough terrain. The color scheme is black/ blue and Hi-Vis. Engine type DOHC twin, Displacement 875cc, Suspension: Front Dual A-arm/12.3”, Rear Dual A-arm/12.3”, Length/width/height 94.0”/59.0”/72.0”, Fuel capacity 5.25 gal., Dry weight 1050 lb., Towing N/A, Bed capacity N/A, Price $12,999. 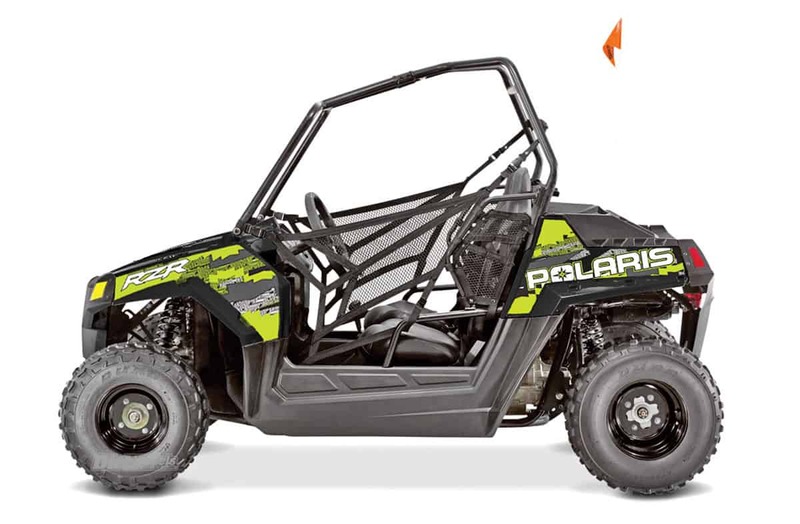 The Polaris Ace 570 utilizes a dual-A-arm design over the previous year’s MacPherson strut. The A-arms really improve the suspension action. The Ace 570 comes with Electronic Power Steering as a standard option. The engine that powers this Ace is a 567cc four-stroke mill that is paired with a Continuously Variable Transmission. Disc brakes come on all four wheels. Engine type DOHC single, Displacement 567cc, Suspension: Front Dual A-arm/9.0”, Rear Dual A-arm/9.5”, Length/width/height 90.0”/48.0”/68.0”, Fuel capacity 5.25 gal., Dry weight 900 lb., Towing 1500 lb., Bed capacity 240 lb., Price $8,999. 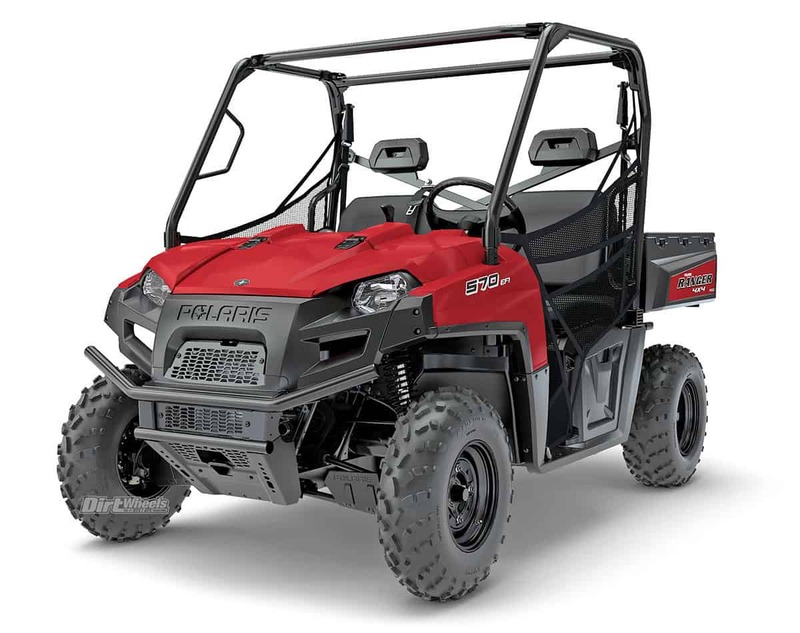 2016’s base-model Polaris Ace had a 320cc engine. Polaris took that model away and added a 32-horsepower, 500cc, ProStar, four-stroke, single-cylinder engine that is electronically fuel-injected. The suspension is the same MacPherson strut front end as the original Ace with 8.2 inches of travel and dual-A-arm suspension in the rear with 9.5 inches of travel. Engine type SOHC Single, Displacement 500cc, Suspension: Front MacPherson Strut/8.2”, Rear Dual A-arm/9.5”, Length/width/height 90.0”/48.0”/67.5”, Fuel capacity 5.25 gal., Dry weight 846 lb., Towing 1500 lb., Bed capacity 240 lb., Price $6,999. The Ace 150 is an all-new machine that is perfect for your playful youth. It features an electronically fuel-injected single-cylinder engine that is paired to a CV-style transmission with forward, neutral and reverse gears. The seat is adjustable, and there is a lot of head room below the roll cage so taller kids or even adults can fit in it. There is a LE Bright White edition for $200 more. 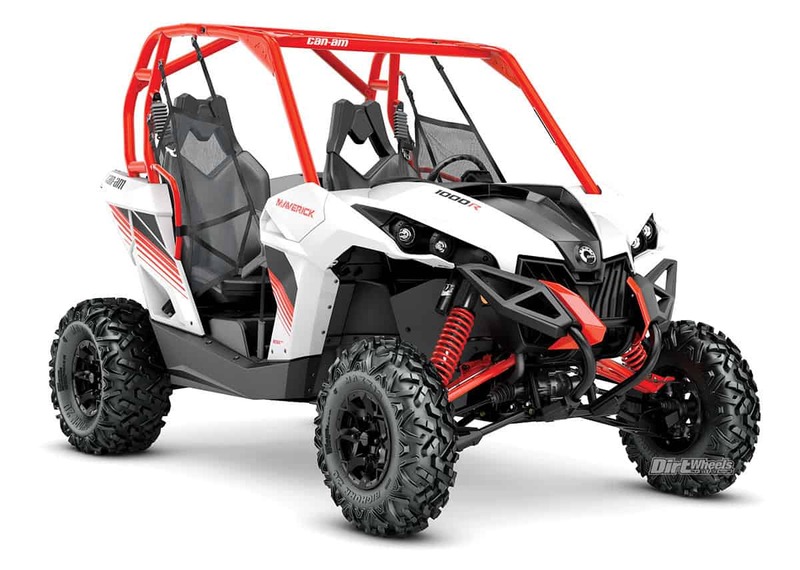 Engine type OHV single, Displacement 149cc, Suspension: Front Dual A-arm/5.1”, Rear Swingarm/6.0”, Length/width/height 85.0”/48.0”/56.0”, Fuel capacity 2.5 gal., Dry weight 556 lb., Towing N/A, Bed capacity 50 lb., Price $3,799. 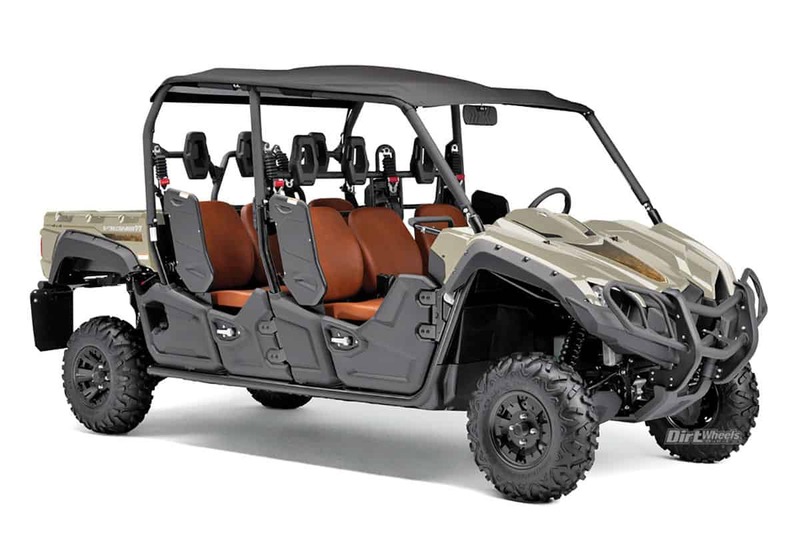 One of Polaris’ newer machines is their four-seat General 1000. 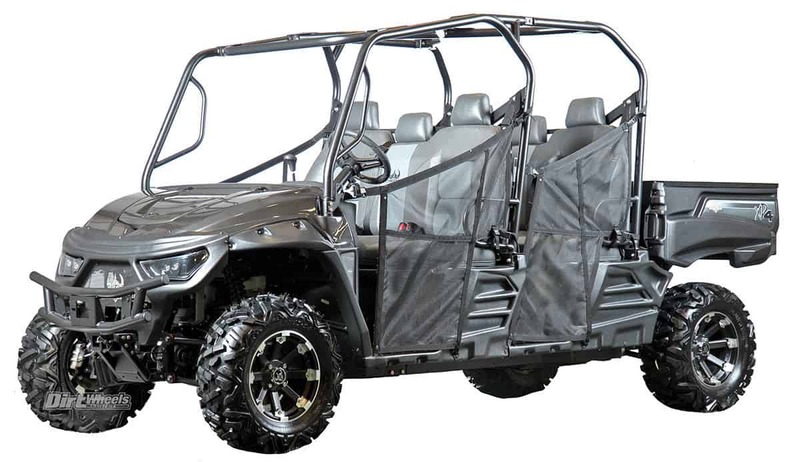 The General line is one of the most comfortable sport utility UTVs ever created. The cockpit is well designed with instrument gauges that tilt with the steering wheel and comfortable bucket seats for all four riders. The machine comes with full doors, cast-aluminum wheels and automotive-style paint. Engine type DOHC twin, Displacement 999cc, Suspension: Front Dual A-arm/12.2”, Rear Dual A-arm/13.2”, Length/width/height 150.2”/62.5”/75.0”, Fuel capacity 9.5 gal., Dry weight 1857 lb., Towing 1500 lb., Bed capacity 600 lb., Price $21,299. 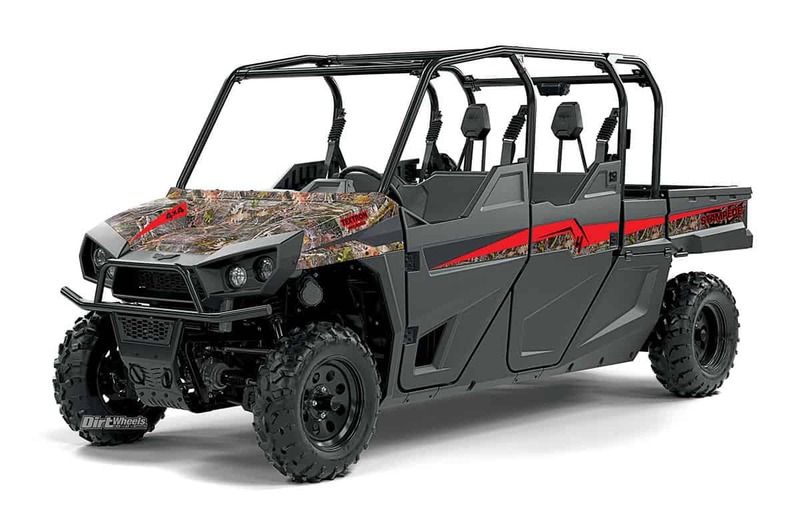 The General was released in 2016, and it quickly became a well-liked UTV designed to shred the trails yet still get the job done around the ranch. 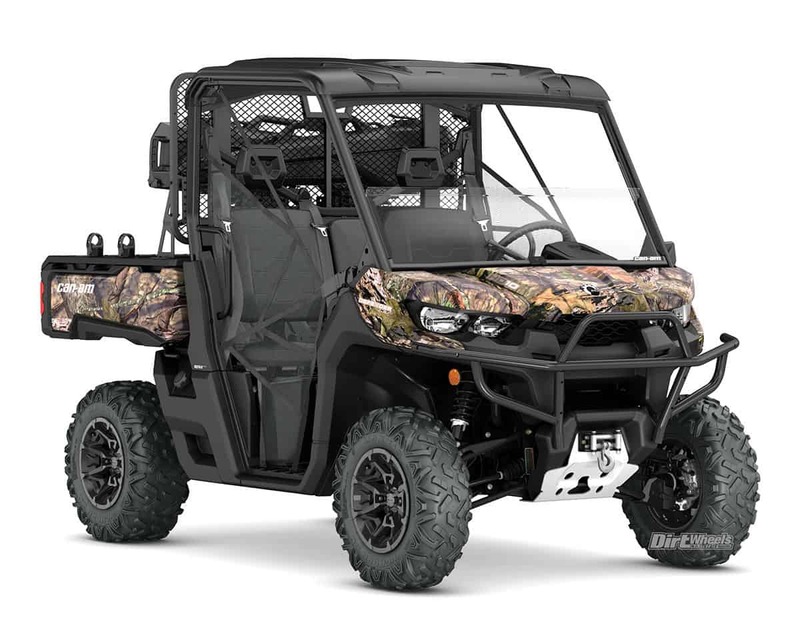 There are five two-seat models—the base ($16,299) EPS Premium ($17,799) Hunter Edition ($18,999), the Deluxe model with a winch and a sound system ($20,299), and a Ride Command Edition for $21,499. Engine type DOHC twin, Displacement 999cc, Suspension: Front Dual A-arm/12.2”, Rear Dual A-arm/13.2”, Length/width/height 150.2”/62.5”/75.0”, Fuel capacity 9.5 gal., Dry weight 1857 lb., Towing 1500 lb., Bed capacity 600 lb., Price $16,299–$21,299. 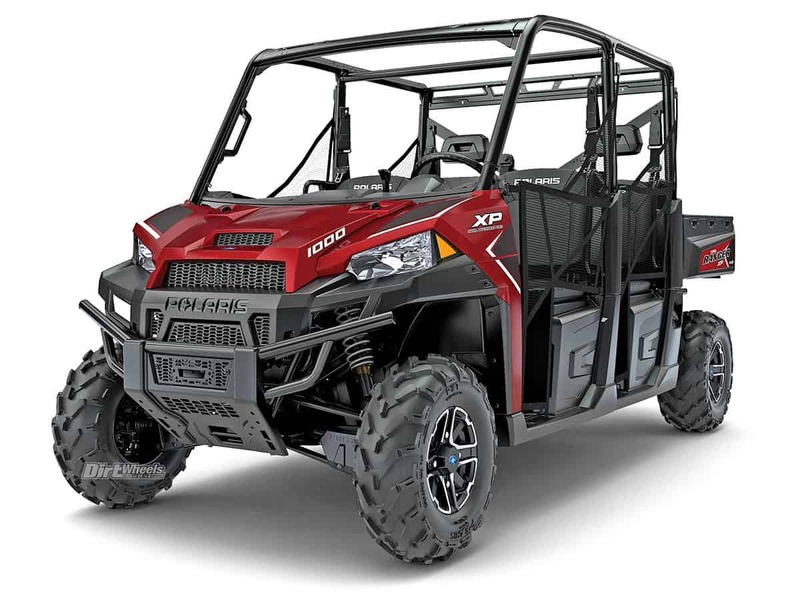 New for 2018 in the Ranger lineup is the remodeled XP 1000 EPS. All of the bodywork and the frame are new and refined. The machine holds three riders with a powerful 999cc four-stroke engine to power it. There is 11 inches of suspension travel on each corner of the machine, and the EPS model has aluminum wheels. The Northstar Edition has a fully enclosed cab for $23,999 that includes AC and heat. Engine type DOHC twin, Displacement 999cc, Suspension: Front Dual A-arm/11.0”, Rear Dual A-arm/11.0”, Length/width/height 120.0”/62.5”/77.0”, Fuel capacity 11.5 gal., Dry weight 565 lb., Towing 2500 lb., Bed capacity 1000 lb., Price $15,299–$23,999. 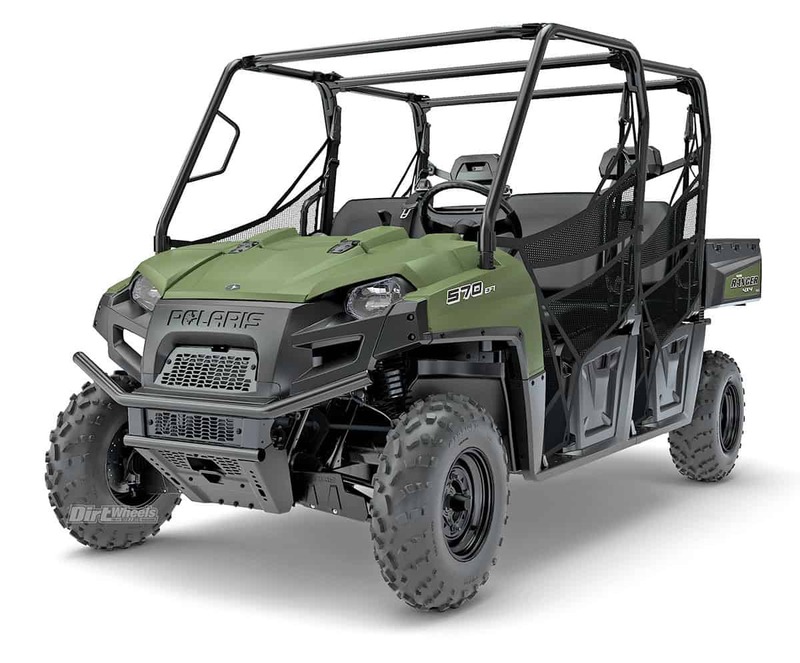 The Polaris Ranger Crew XP 1000 did not get the new frame or bodywork of the three-seater. It comes with EPS as a standard feature. It is the same as the Crew XP 900, but it packs a few more ponies. These machines seat six and are designed for utility work. There is a fully enclosed Northstar Edition model with heat and AC for $25,999. Engine type DOHC twin, Displacement 999cc/875cc, Suspension: Front Dual A-arm/10.0”, Rear Dual A-arm/10.0”, Length/width/height 148.5”/61.0”/76.0”, Fuel capacity 10.0 gal., Dry weight 1636 lb., Towing 2000 lb., Bed capacity 1000 lb., Price $16,999/$13,699. The Ranger Diesel Crew holds a 1028cc, three-cylinder diesel engine and has an alternator output of 110 amps. It is favored by those who keep diesel fuel on hand for other machinery. It can tow up to 2000 pounds. The bed can hold up to 1000 pounds with dumping capabilities. If you want a crew-sized machine with an engine that will last a long time, this Ranger is a suitable choice. 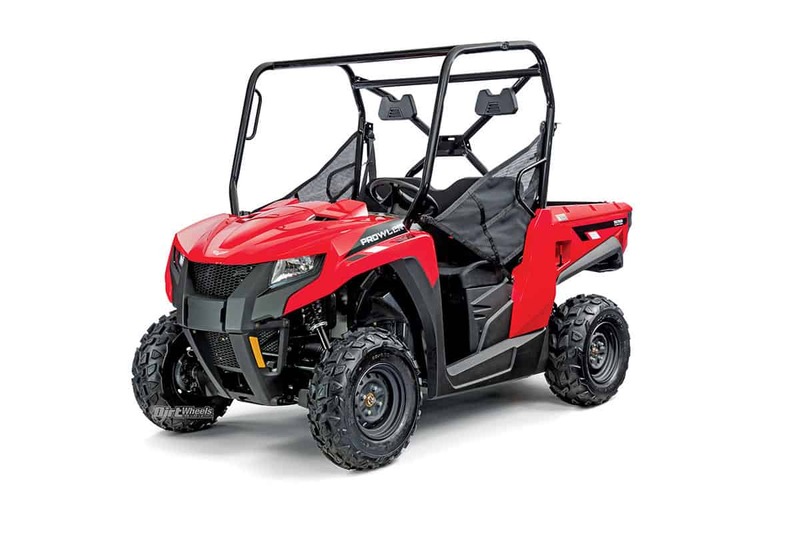 Engine type Diesel triple, Displacement 1028cc, Suspension: Front Dual A-arm/10.0”, Rear Dual A-arm/10.0”, Length/width/height N/A, Fuel capacity 10 gal., Dry weight 688 lb., Towing 2000 lb., Bed capacity 1000 lb., Price $14,999. 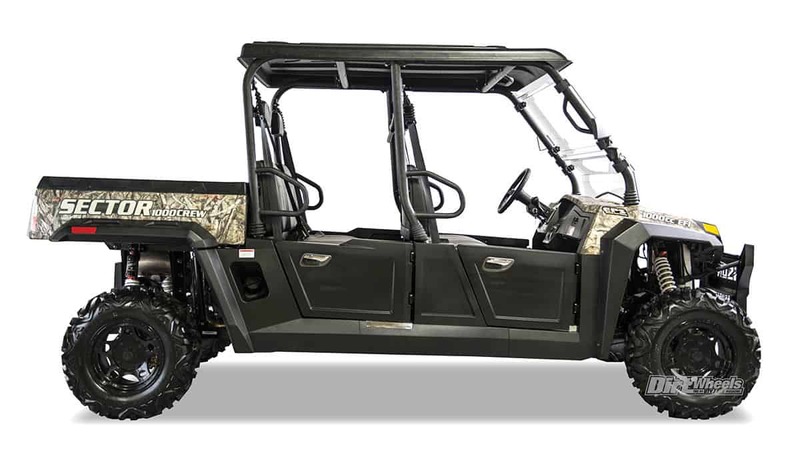 This Ranger Crew XP 1000 is built to tackle deep mud with special features like heavy-duty bumpers, a winch, high-clearance suspension A-arms, full doors and air/CVT intake tubes that are routed above the bed. Twenty-eight-inch -tall High Lifter Outlaw 2 tires help this machine claw through muck. The two-seater High Lifter Ranger sells for $18,999. Engine type DOHC twin, Displacement 999cc, Suspension: Front Dual A-arm/8.0”, Rear Dual A-arm/8.8”, Length/width/height 148.5”/61.0”/76.0”, Fuel capacity 10 gal., Dry weight 1587 lb., Towing 2000 lb., Bed capacity 1000 lb., Price $20,499. The Ranger XP 900 sports an EFI 875cc ProStar motor that pumps out 68 horsepower. 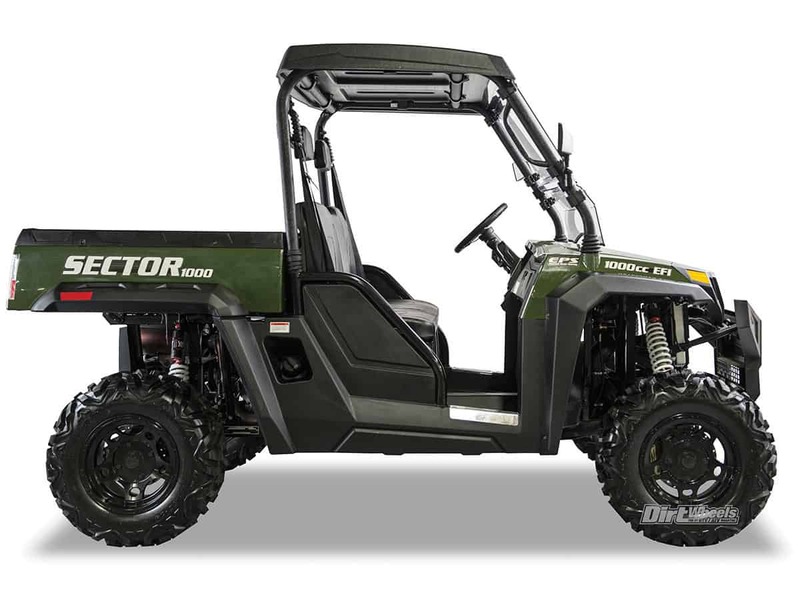 The XP 900 comes in an electronic power steering model for $13,299 that comes in four color choices. Two of those come with aluminum wheels with automotive-style paint. The machine can tow up to 2000 pounds and hold 1000 in its rear dump bed. Engine type DOHC twin, Displacement 875cc, Suspension: Front Dual A-arm/10.0”, Rear Dual A-arm/10.0”, Length/width/height 116.5”/60.0”/76.0”, Fuel capacity 10 gal., Dry weight 1324 lb., Towing 2000 lb., Bed capacity 1000 lb., Price $13,099. 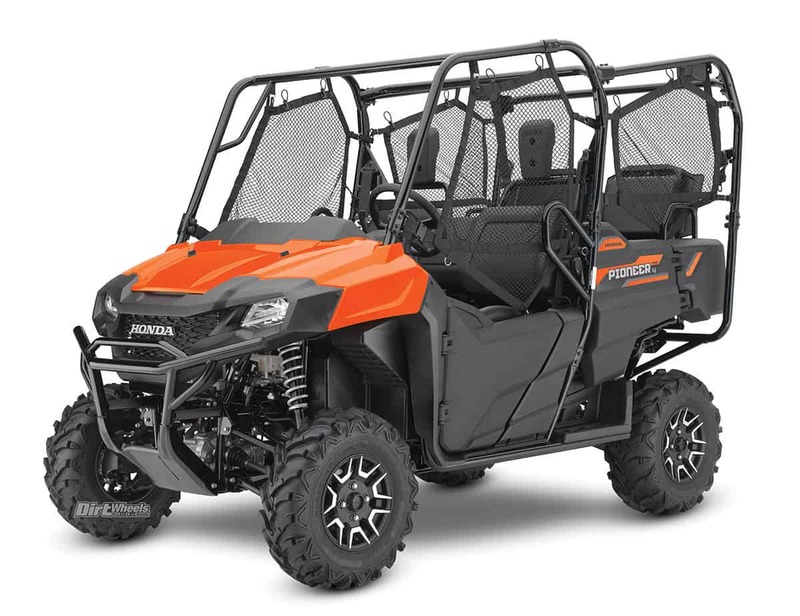 If you want a machine that can hold up to six passengers but don’t need all the power of a 900 motor, then the Ranger 570-6 is a solid choice. It sports an EFI, 44-horsepower, 567cc, four-stroke engine. Front MacPherson struts with 9 inches of wheel travel complement the 10-inch-travel rear dual-A-arm design. Engine type DOHC single, Displacement 567cc, Suspension: Front MacPherson strut/9.0”, Rear Dual A-arm/10.0”, Length/width/height 146.0”/60.0”/74.0”, Fuel capacity 10 gal., Dry weight 1392 lb., Towing 1500 lb., Bed capacity 800 lb., Price $11,799/$10,799. The Polaris Ranger lineup has so many options! The Ranger 570 Full Size is a good one. It can seat three comfortably and has enough power to carry a total payload capacity of up to 1500 pounds and can tow 1500 pounds. 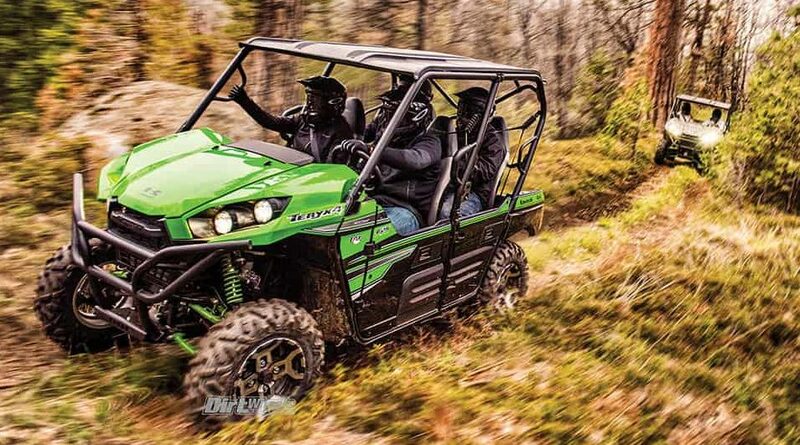 While the Ranger line is utility-inspired, this machine does well out on the trails. Engine type DOHC single, Displacement 567cc, Suspension: Front MacPherson strut/9.0”, Rear Dual A-arm/10.0”, Length/width/height 114.0”/60.0”/74.0”, Fuel capacity 10 gal., Dry weight 1070 lb., Towing 1500 lb., Bed capacity 800 lb., Price $10,299. 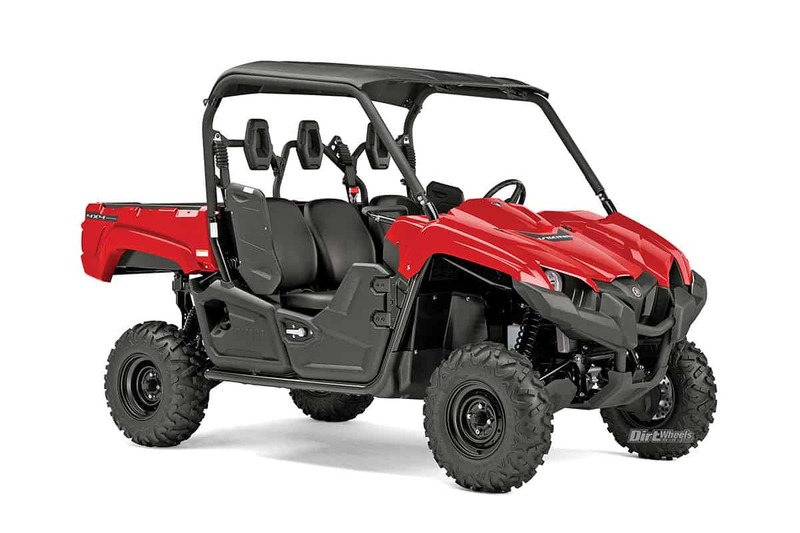 The Ranger 500 is Polaris’ take at a well-priced side-by-side that has reasonable features. It is powered by a DOHC single-cylinder four-stroke engine that puts out around 32 horsepower. It has all-wheel drive and can be changed to two-wheel drive. The cargo box can hold 500 pounds, and it can tow 1500 pounds. You can upgrade the engine to a 570 with 44 horsepower. Engine type DOHC single, Displacement 567cc/500cc, Suspension: Front MacPherson strut/9.0”, Rear Dual A-arm/10.0”, Length/width/height 110.0”/58.0”/73.0”, Fuel capacity 9.0 gal., Dry weight 1073 lb., Towing 1500 lb., Bed capacity 500 lb., Price $9999/$8999. Engine type 48-volt single, Displacement Shocking, Suspension: Front MacPherson strut/9.0”, Rear Dual A-arm/10.0”, Length/width/height 110.0”/58.0”/73.0”, Fuel capacity N/A, Dry weight 1328 lb., Towing 1500 lb., Bed capacity 500 lb., Price $22,999. 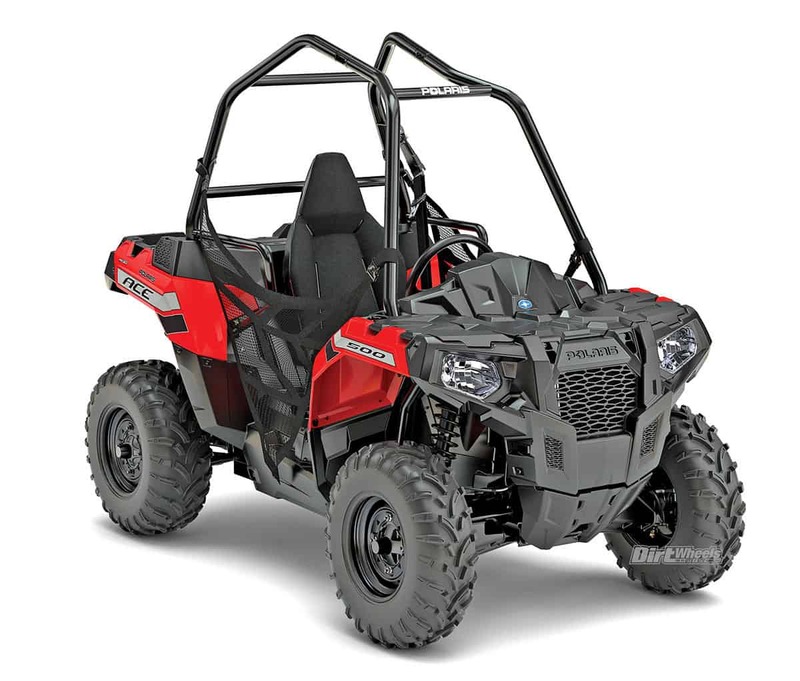 Engine type OHV single, Displacement 168cc, Suspension: Front Twin A-arm/N/A, Rear Swingarm/N/A, Length/width/height 98.0”/48.0”/60.0”, Fuel capacity 2.9 gal., Dry weight 540 lb., Towing N/A, Bed capacity N/A, Price $3,699. Engine type SOHC V-twin, Displacement 951cc, Suspension: Front Dual A-arm/17.0”, Rear Trailing arm/18.0”, Length/width/height 120.0”/64.0”/66.0”, Fuel capacity 8.8 gal., Dry weight 1305 lb., Towing N/A, Bed capacity 300 lb., Price $16,999/$18,999. 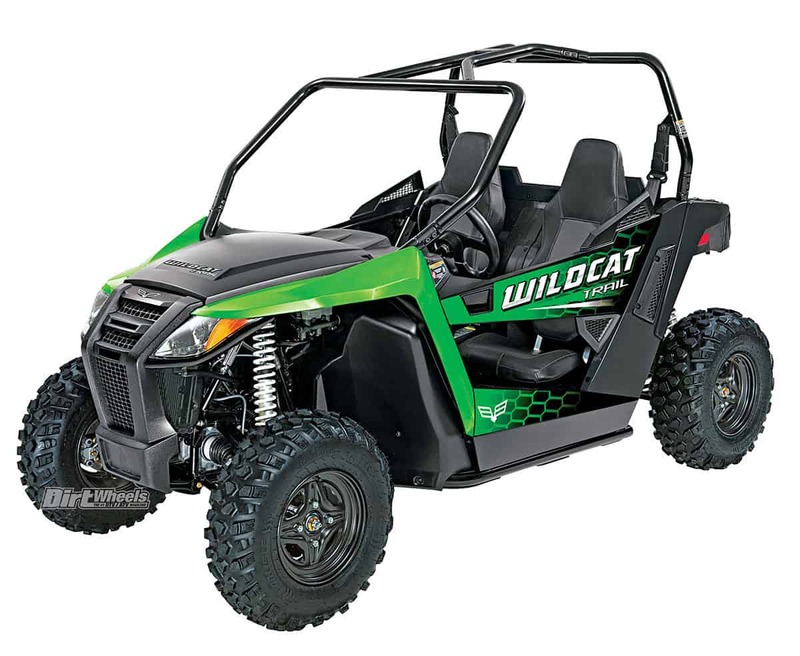 Both Wildcat Sport 700 models utilize an inline-twin four-stroke engine producing over 60 horsepower. Mated to the engine is a CVT with the Team clutch. The 4×4 system has a front-locking differential, and EPS is standard. The Sport is 60 inches wide with dual-A-arm suspension front and rear. The XT has JRi EXC-1 shocks, while the LTD gets Stage 5 Elka shocks. Engine type SOHC twin, Displacement 700cc, Suspension: Front Dual A-arm/12.2”, Rear Dual A-arm/12.2”, Length/width/height 111.0”/60.0”/64.0”, Fuel capacity 7.4 gal., Dry weight 1054 lb., Towing 1500 lb., Bed capacity 300 lb., Price $14,599/$15,999. Engine type SOHC V-twin, Displacement 951cc, Suspension: Front Dual A-arm/17.0”, Rear Trailing arm/18.0”, Length/width/height 149.0”/64.0”/71.0”, Fuel capacity 8.8 gal., Dry weight 1536 lb., Towing N/A, Bed capacity 300 lb., Price $18,999. Engine type SOHC twin, Displacement 700cc, Suspension: Front Dual A-arm/10”, Rear Dual A-arm/10.5”, Length/width/height 111.0”/50.0”/64.0”, Fuel capacity 7.4 gal., Dry weight 990 lb., Towing 1500 lb., Bed capacity 300 lb., Price $11,499/$12,499/$$13,499. 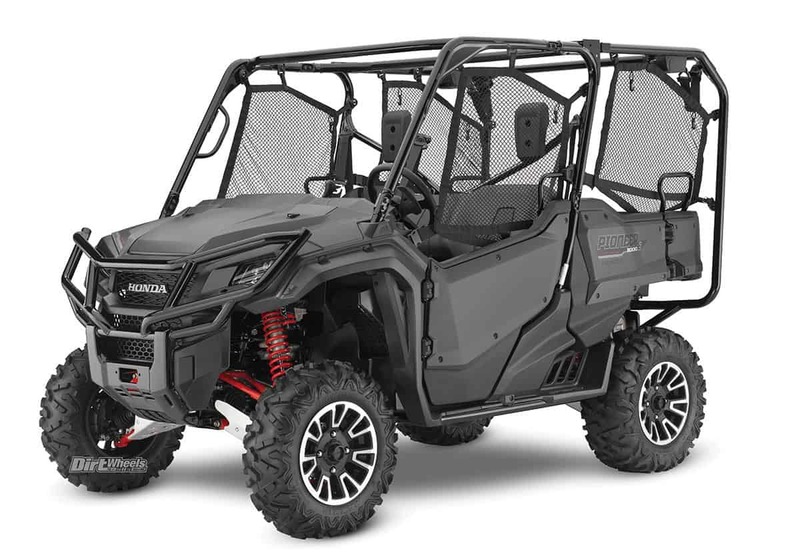 The all-new 2018 Havoc X crossover UTV from Textron Off-Road is a high-performance machine with a work ethic. It blends class-leading suspension and ground clearance with substantial payload and towing capacities. Horsepower is up 20 over the Textron Stampede at 100 horsepower and 67 foot-pounds of torque. Double0A-arm suspension delivers nearly 13 inches of suspension travel with 2.5-inch aluminum King shocks. Engine type SOHC twin, Displacement 957cc, Suspension: Front Dual A-arm/12.8”, Rear Dual A-arm/12.9”, Length/width/height 126.0”/64.0”/77.0”, Fuel capacity 9.5 gal., Dry weight 1755 lb., Towing 2000 lb., Bed capacity 600 lb., Price TBA. 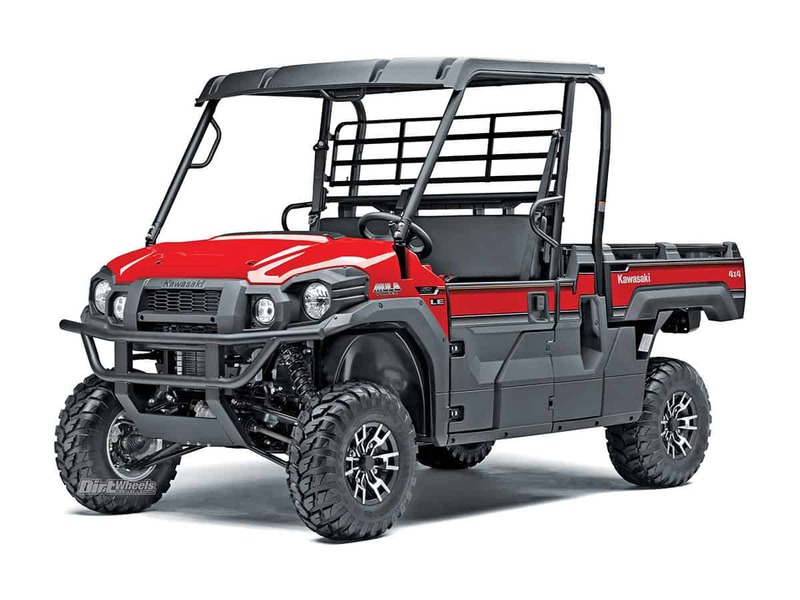 The Stampede is a relatively new machine with recreational utility features and a very smooth and effective 80-horsepower engine. It has dual-A-arm suspension up front with 9.25 inches of travel and in the rear with 10.5 inches of travel. Both models have EPS, but the X version has aluminum wheels and premium seats. Engine type Liquid-cooled, EFI twin four-stroke, Displacement 846cc, Suspension: Front Dual A-arm/9.5”, Rear Dual A-arm/10.5”, Length/width/height 126.0”/58.0”/75.0”, Fuel capacity 9.5 gal., Dry weight 1690 lb., Towing 2000 lb., Bed capacity 600 lb., Price $13,999/$14,799. 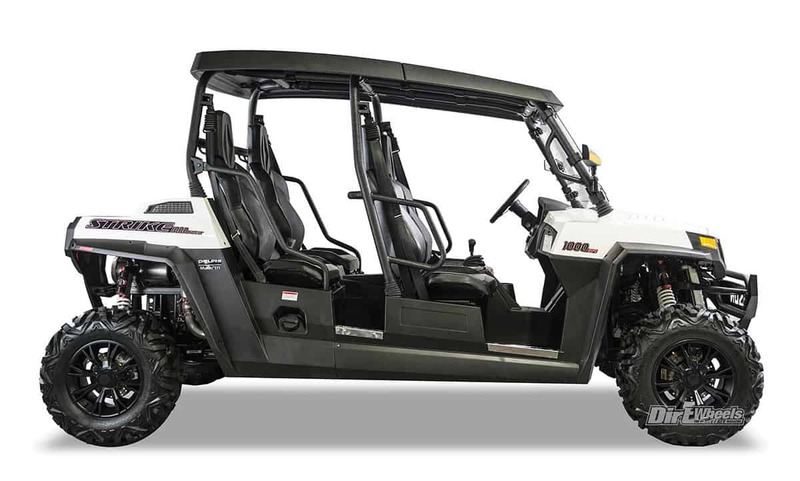 The Stampede 4 and 4X are new machines for Textron. Even with the roomy cab, the Stampede has an “extra cab” area between the seats and the manual dump bed. 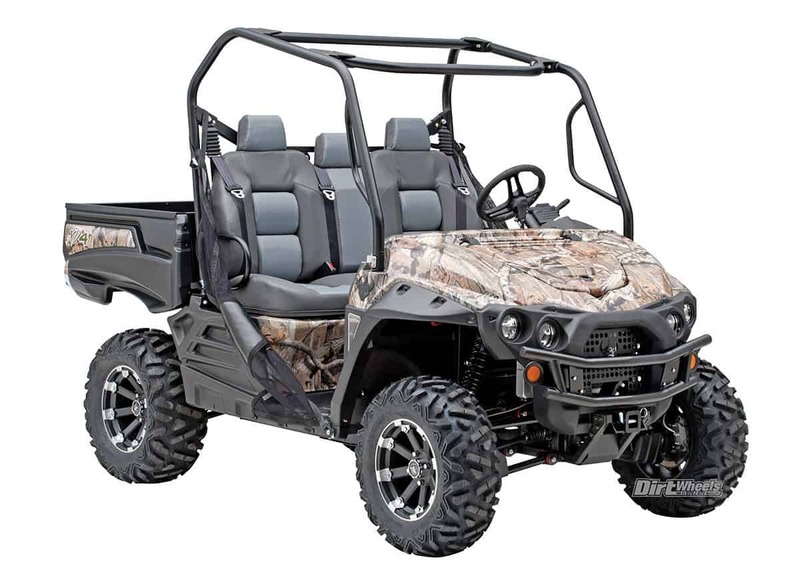 The Stampede has recreational utility features and an 80-horsepower engine. It has dual-A-arm suspension up front with 9.25 inches of travel and in the rear with 10.5 inches of travel. Both models have EPS, but the 4 has steel wheels and black seats, while the 4X has two-tone seats, aluminum wheels and Maxxis Bighorn tires. Engine type SOHC twin, Displacement 846cc, Suspension: Front Dual A-arm/9.5”, Rear Dual A-arm/10.5”, Length/width/height 158.0”/58.0”/75.0”, Fuel capacity 9.5 gal., Dry weight 1905 lb., Towing 2000 lb., Bed capacity 600 lb., Price $15,199/$15,999. 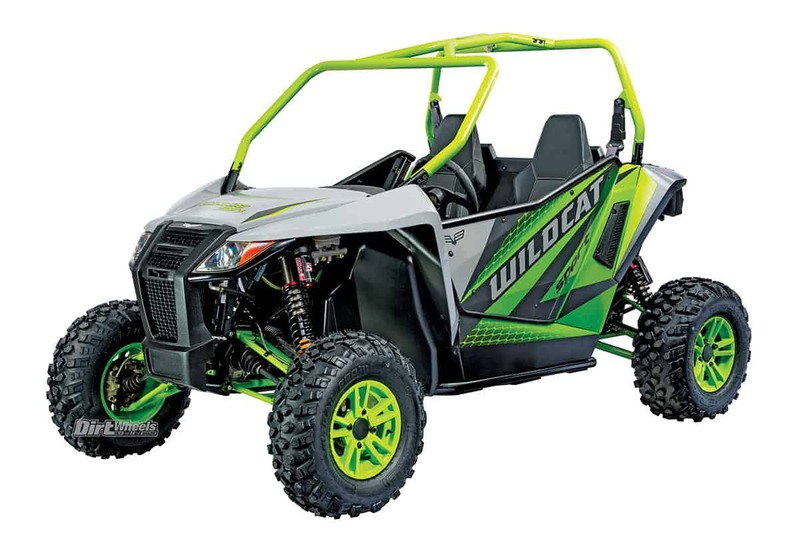 The Textron (formerly Arctic Cat) Prowler 500 has a 443cc, single-overhead-cam, four-stroke engine mated to a CV-style transmission. This machine can tow 1500 pounds, but holds 500 pounds less in the bed. The suspension system on each corner of the 500 uses double-A-arm suspension with 7.5 inches of travel. 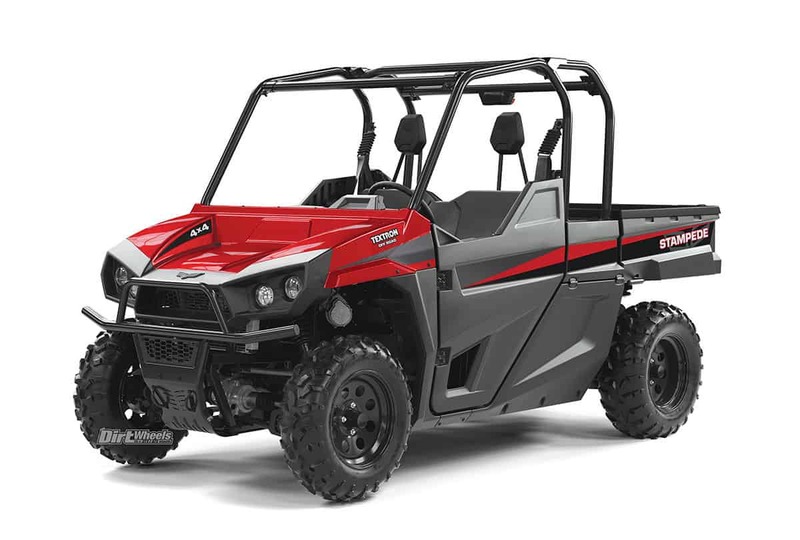 Engine type SOHC single, Displacement 443cc, Suspension: Front Dual A-arm/7.5”, Rear Dual A-arm/7.5”, Length/width/height 106.0”/56.0”/77.0”, Fuel capacity 8.5 gal., Dry weight 1095 lb., Towing 1500 lb., Bed capacity 500 lb., Price $8,499. Engine type DOHC triple, Displacement 998cc, Suspension: Front Dual A-arm/16.2”, Rear Dual A-arm/17.0”, Length/width/height 122.8”/64.0”/72.2”, Fuel capacity 9.0 gal., Dry weight 1512 lb., Towing N/A, Bed capacity 300 lb., Price N/A. 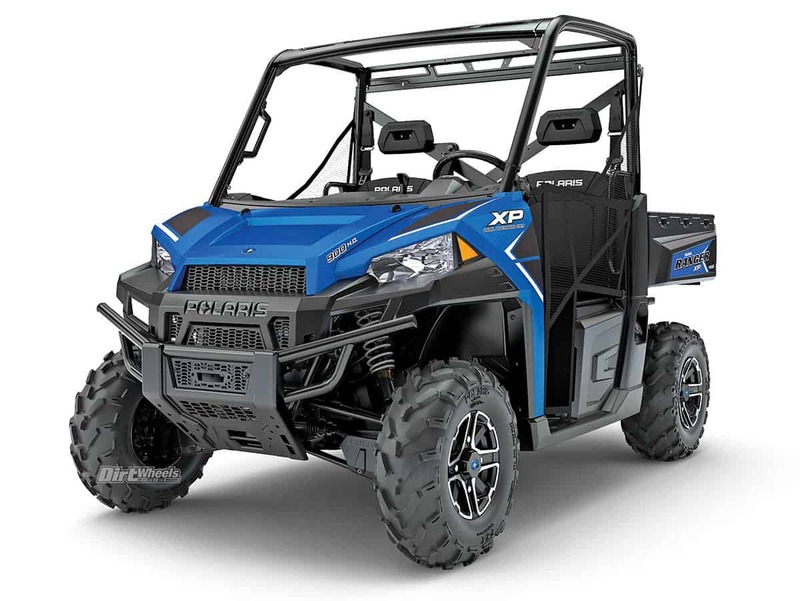 The Special Edition model of the YXZ1000R and SS models boasts a sleek-looking color scheme, but style isn’t what makes this machine special. The Fox Podium 2.5 X2 shocks are the impressive upgrade. They are fully adjustable and make the machine much more comfortable to drive. You can purchase a gear-reduction kit for all YXZ models. Engine type DOHC triple, Displacement 998cc, Suspension: Front Dual A-arm/16.2”, Rear Dual A-arm/17.0”, Length/width/height 122.8”/64.0”/72.2”, Fuel capacity 9.0 gal., Dry weight 1512 lb., Towing N/A, Bed capacity 300 lb. Price N/A. Engine type DOHC single, Displacement 708cc, Suspension: Front Dual A-arm/9.7”, Rear Dual A-arm/10.6”, Length/width/height 116.9”/60.6”/74.2”, Fuel capacity 9.7 gal., Dry weight 1287 lb., Towing 1500 lb., Bed capacity 300 lb., Price $10,999. Yamaha’s all-new machine is the Wolverine X4. The X4 has the capability of taking four riders along tight trails with a short wheelbase and a new 847cc engine. When you utilize the rear seats, you do lose some cargo bed capacity like you do with a Honda Pioneer 1000-5, but the ability to take your family and friends along for a ride in the woods is awesome. There is an X4 SE version for $17,249. Engine type DOHC twin, Displacement 847cc, Suspension: Front Dual A-arm/8.7”, Rear Dual A-arm/8.9”, Length/width/height 122.0”/59.8”/77.2”, Fuel capacity 9.2 gal., Dry weight 1666 lb., Towing 2000 lb., Bed capacity 600 lb., Price $15,999. 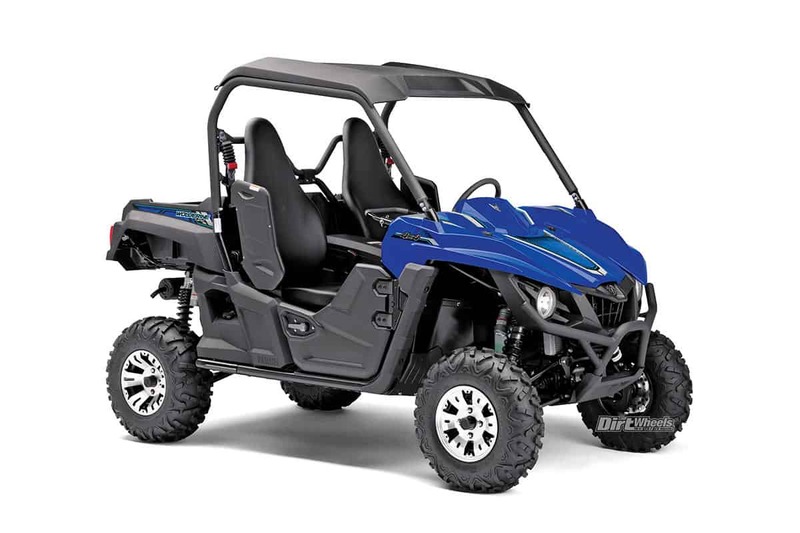 Yamaha started a revolution with the Rhino UTV. The next release was the three-seat Viking with a 686cc, four-stroke powerplant. It was designed for utility purposes with a bit of recreation in mind. Suspension numbers reach to 8.1 inches of wheel travel in the front and the rear. 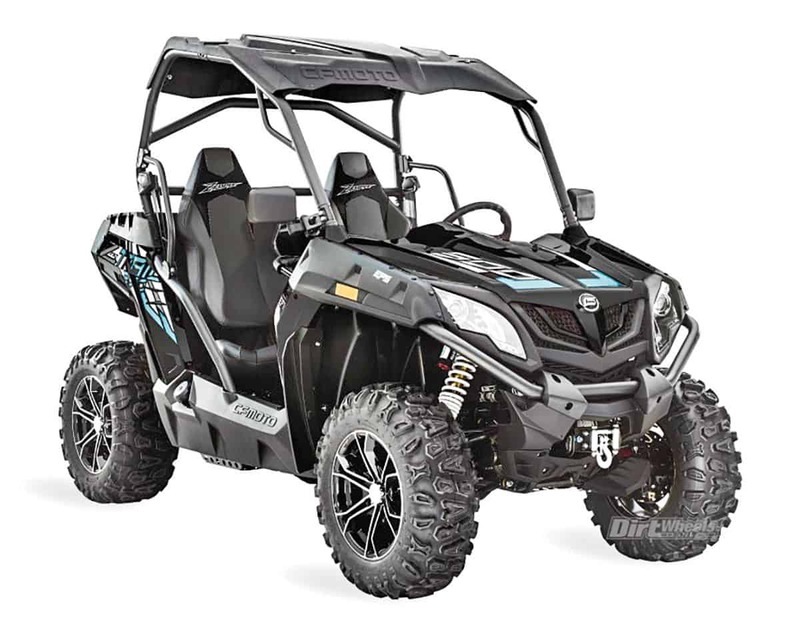 The EPS model goes for $12,999, while the Ranch Edition is set at $14,199. Engine type SOHC Single, Displacement 686cc, Suspension: Front Dual A-arm/8.1”, Rear Dual A-arm/8.1”, Length/width/height 122.1”/61.8”/75.8”, Fuel capacity 9.7 gal., Dry weight 1431 lb., Towing 1500 lb., Bed capacity 600 lb., Price $11,999. The Viking VI looks like a dirt limo, but it can carry a whole crew of people around on job sites or for hunting and trail explorations. It shares the same engine and suspension numbers as the three-seat Viking, but an anti-sway bar was added in the rear. It has a diff-lock feature. The SE model goes for $14,999, and the Ranch Edition model goes for $15,599. Engine type SOHC single, Displacement 686cc, Suspension: Front Dual A-arm/8.1”, Rear Dual A-arm/8.1”, Length/width/height 153.5”/61.8”/76.6”, Fuel capacity 9.7 gal., Dry weight 1695 lb., Towing 1500 lb., Bed capacity 600 lb., Price $13,999.